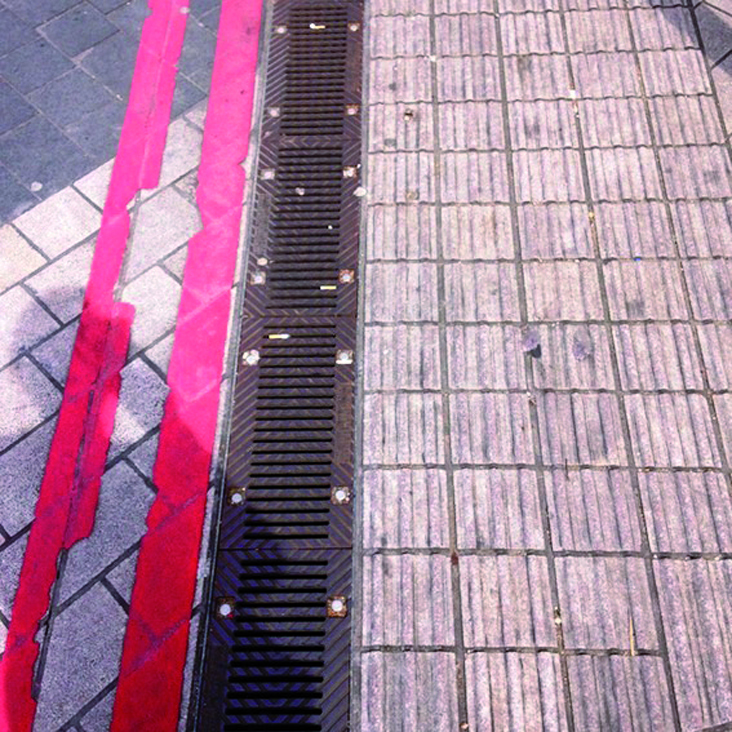 Nick and Gemma live in a shared house and have studios in the same building; they exhibited their own work together in 2015 London Design Week, however they have never produced a shared body of work. 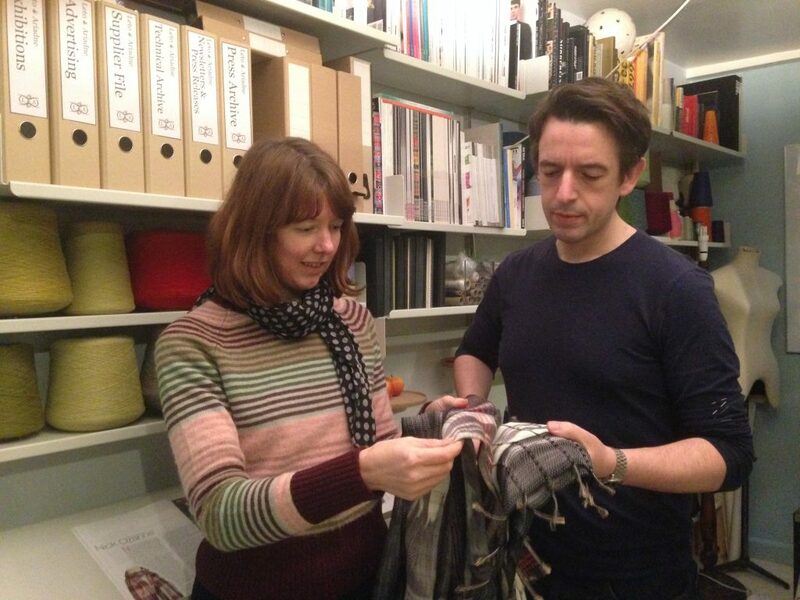 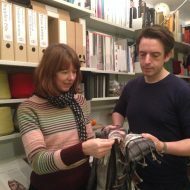 They met 20 years ago as students on the Textiles and Fashion degree course at Winchester School of Art and have subsequently built their careers. 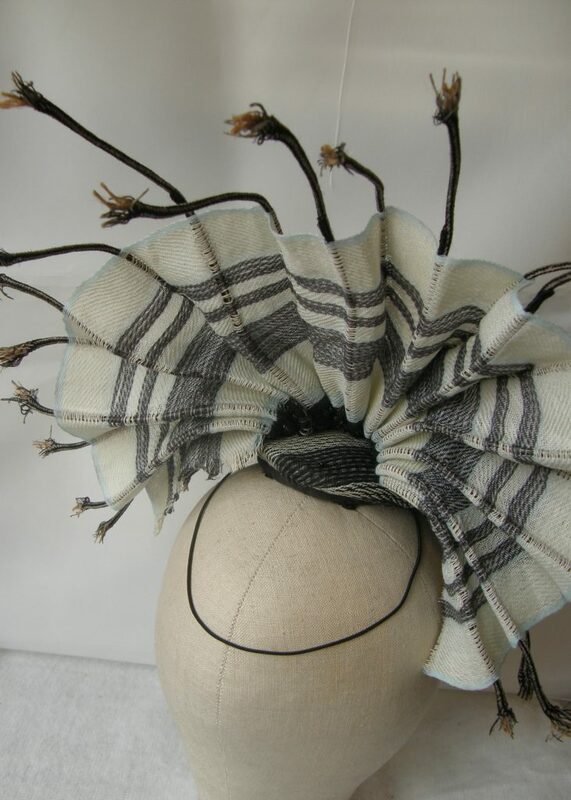 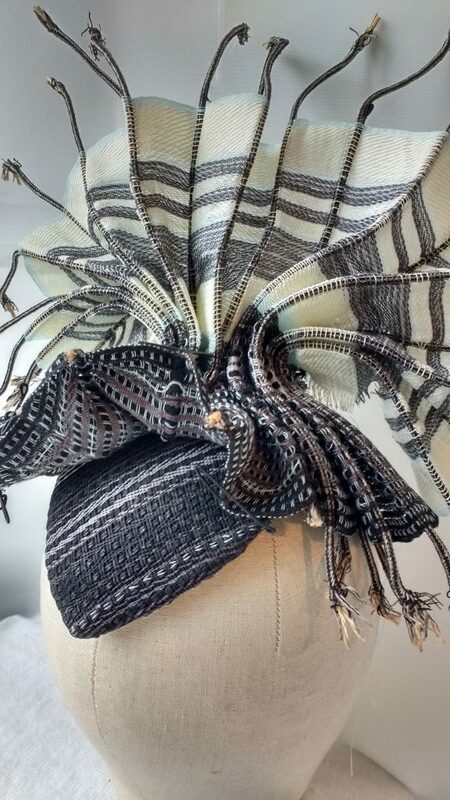 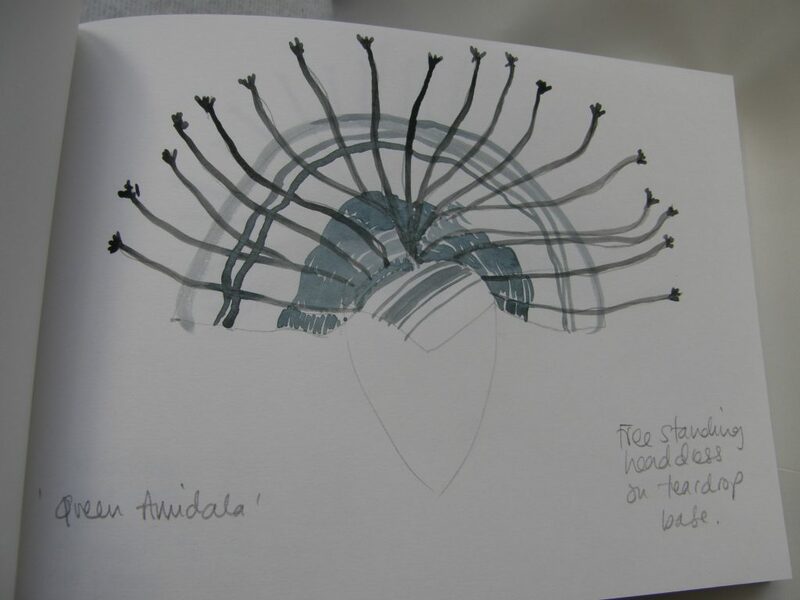 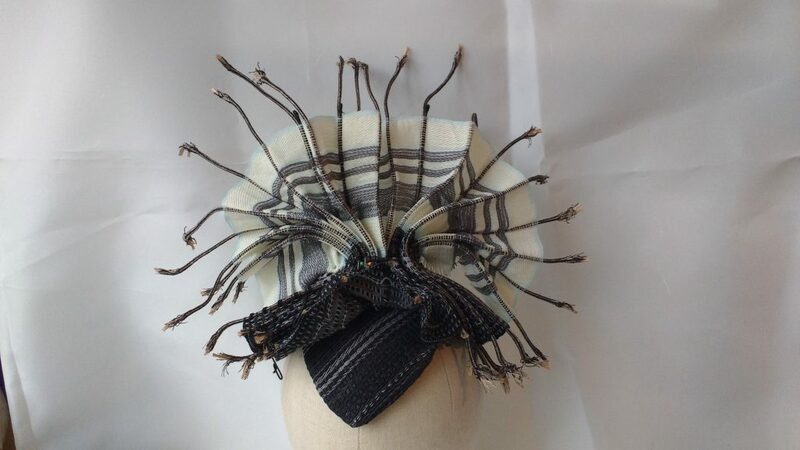 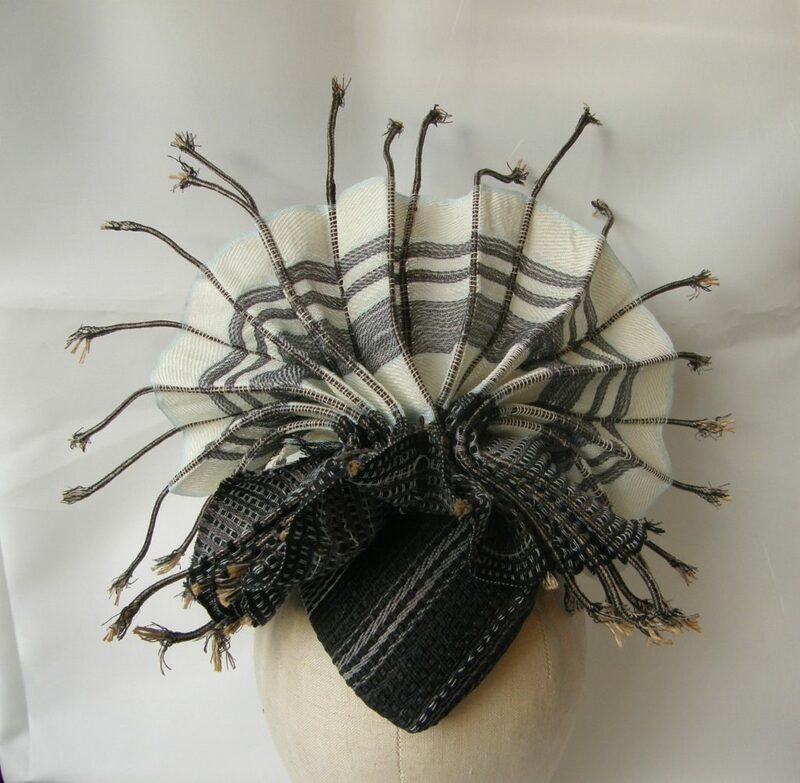 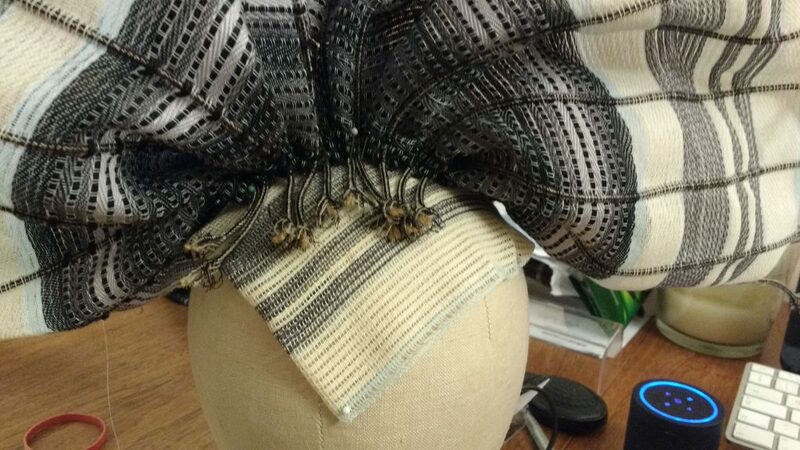 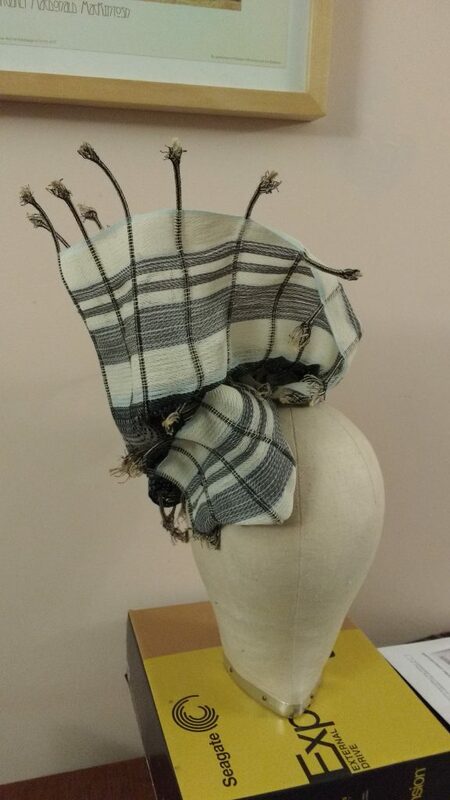 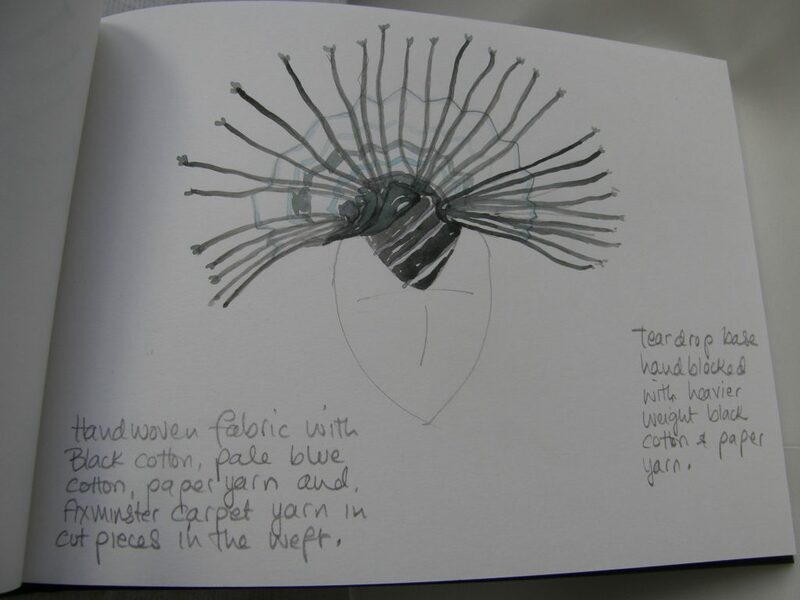 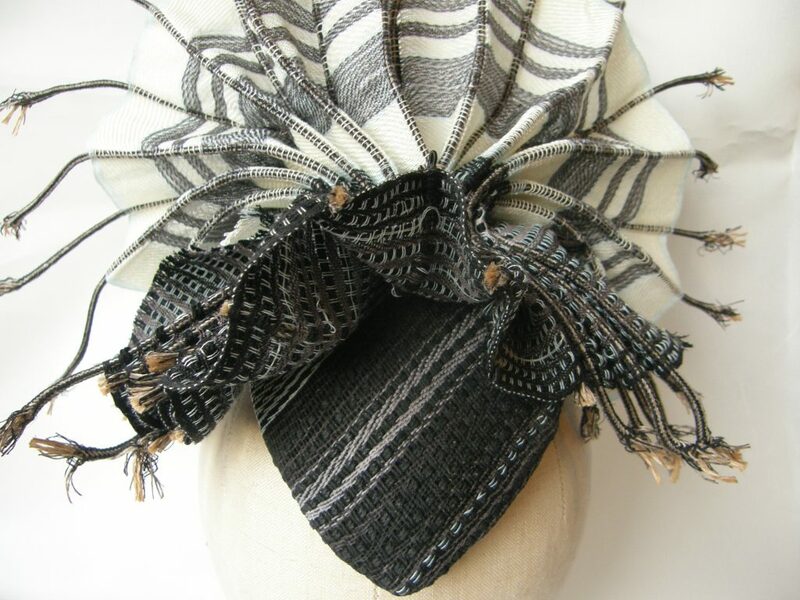 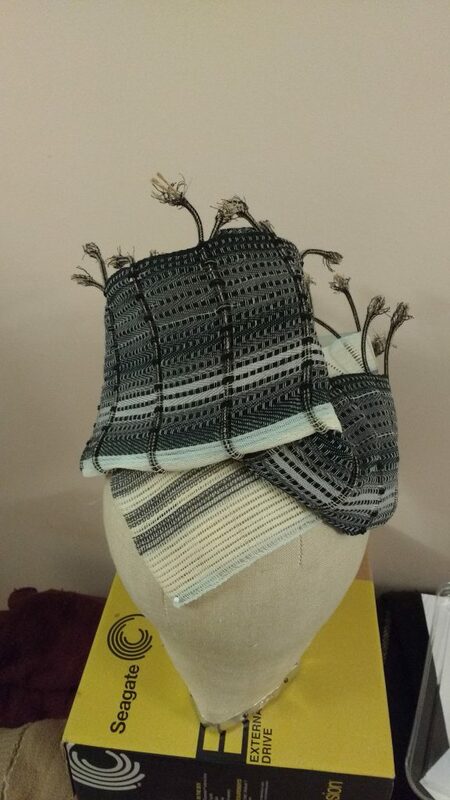 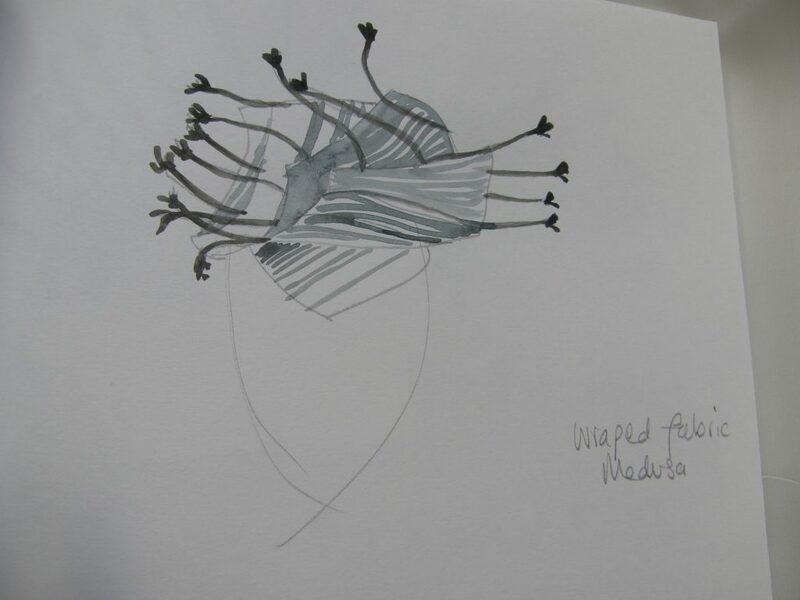 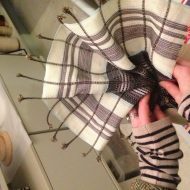 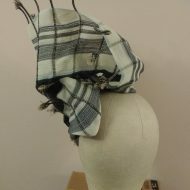 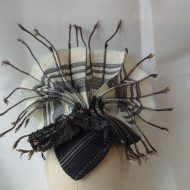 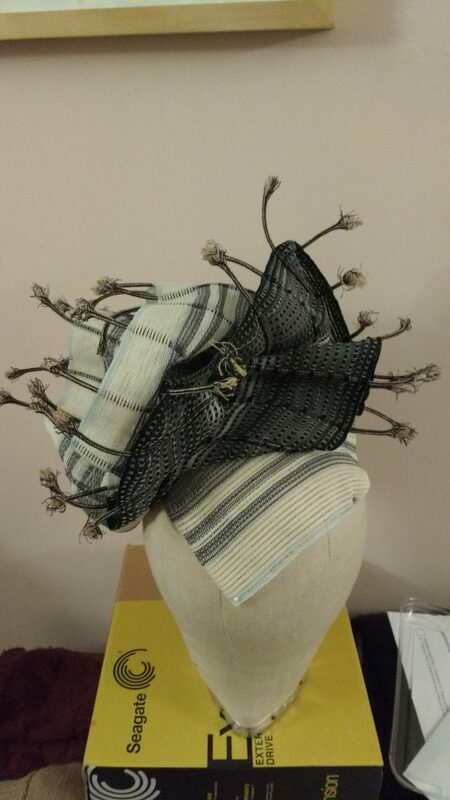 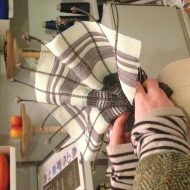 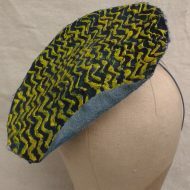 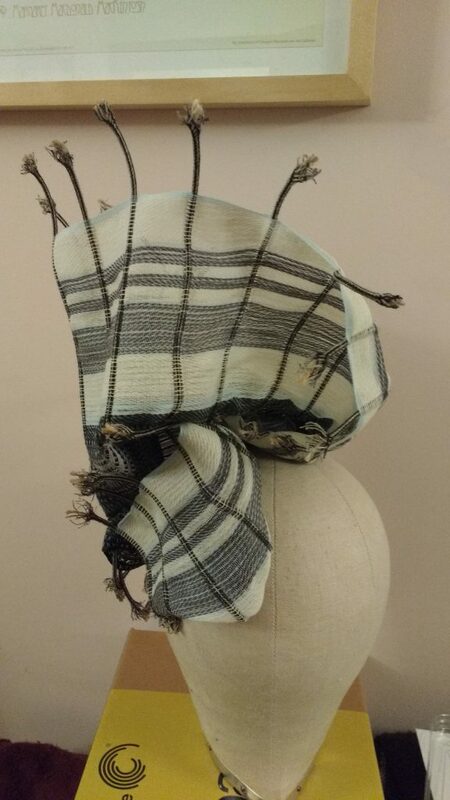 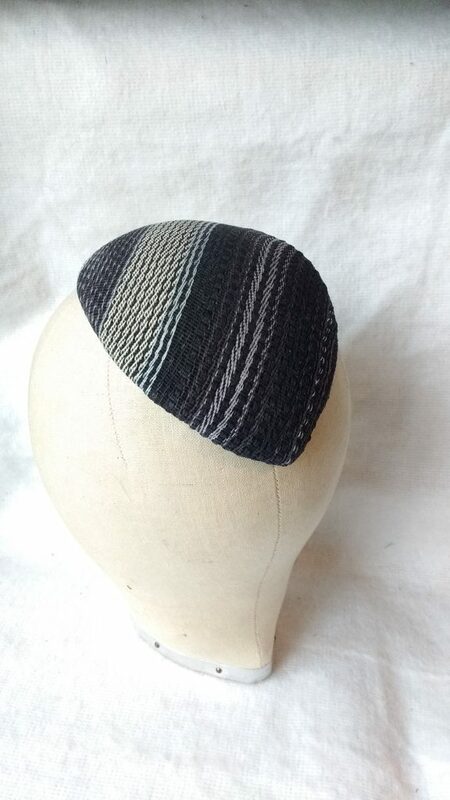 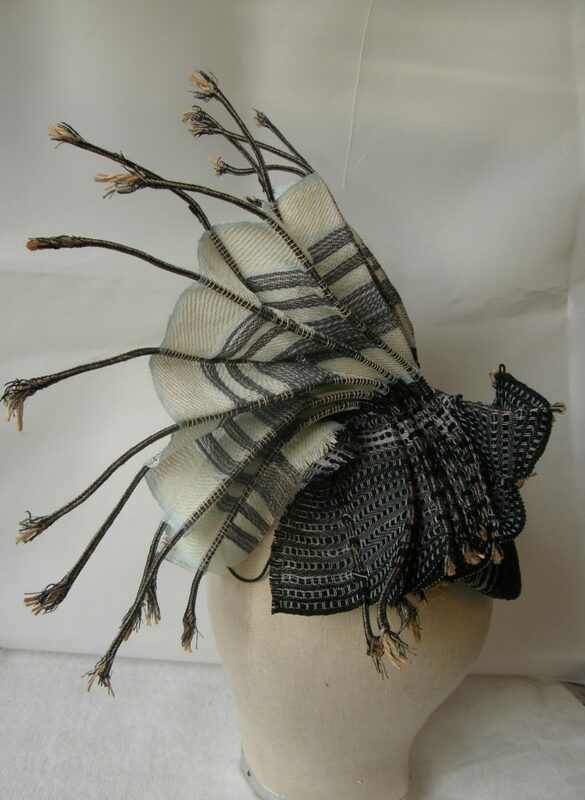 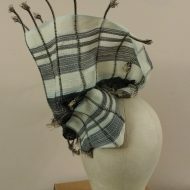 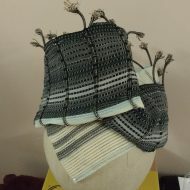 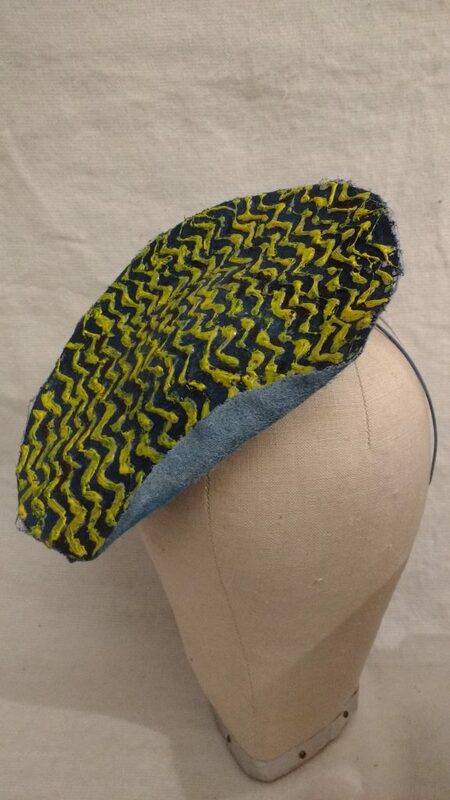 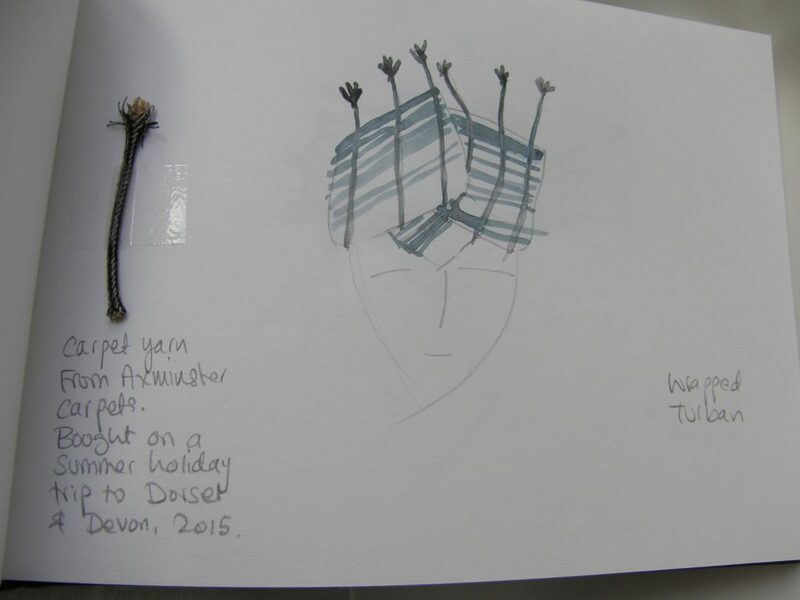 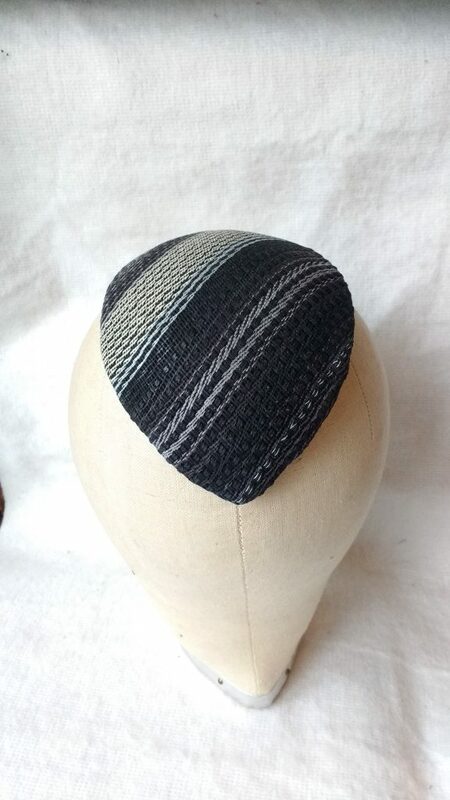 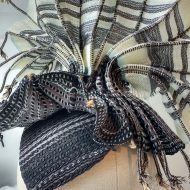 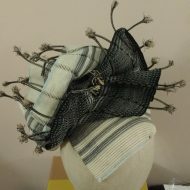 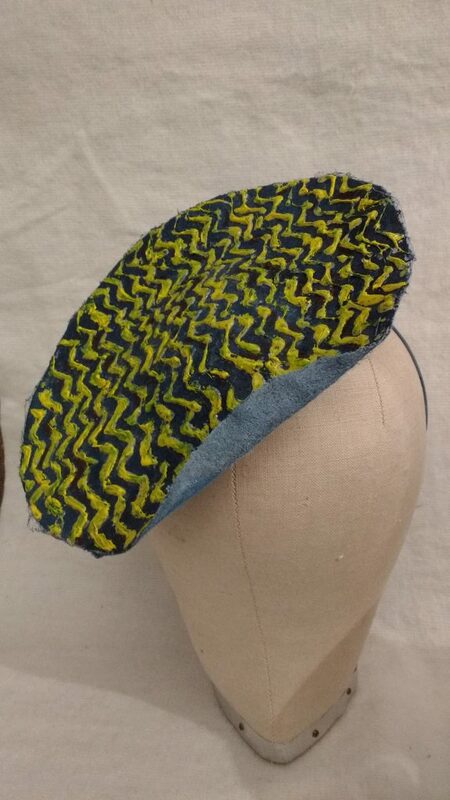 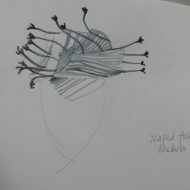 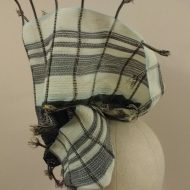 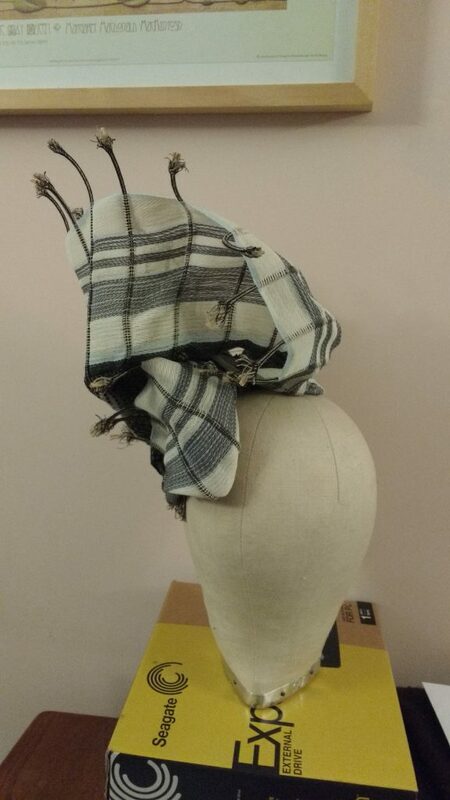 Nick designs and makes hand woven textiles under his studio label Leto and Ariadne, and Gemma works with vintage fabrics making hair accessories, bridal wear and more recently, millinery. 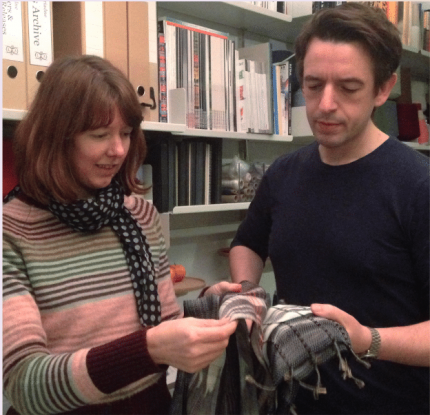 Two Make offered Gemma and Nick a prompt to change direction in part of their making lives. 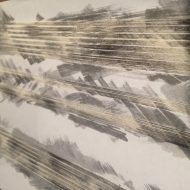 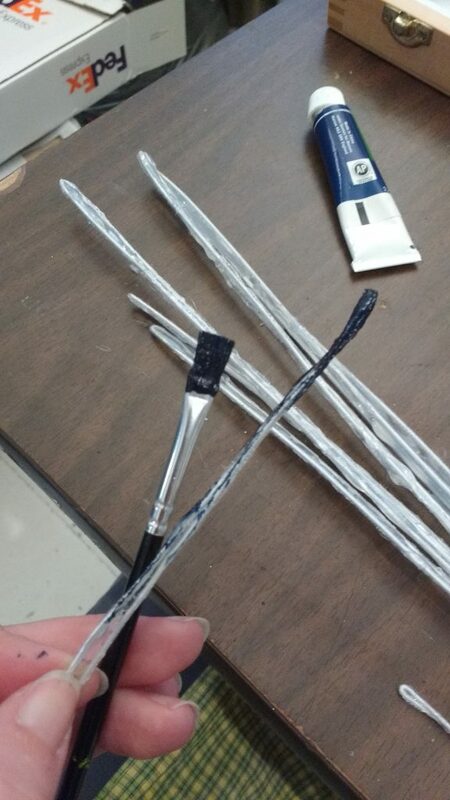 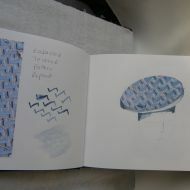 So what happens when two makers are eager to “play, experiment, make mess, and create sketchbooks”? 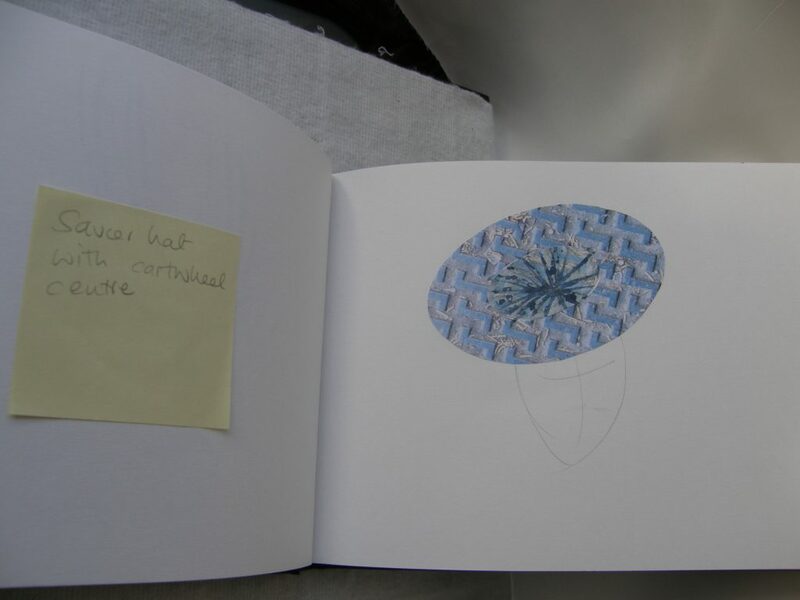 Responding to this same source material Gemma and Nick have explored the proper ties of new materials: researching, sketching and fabricating. 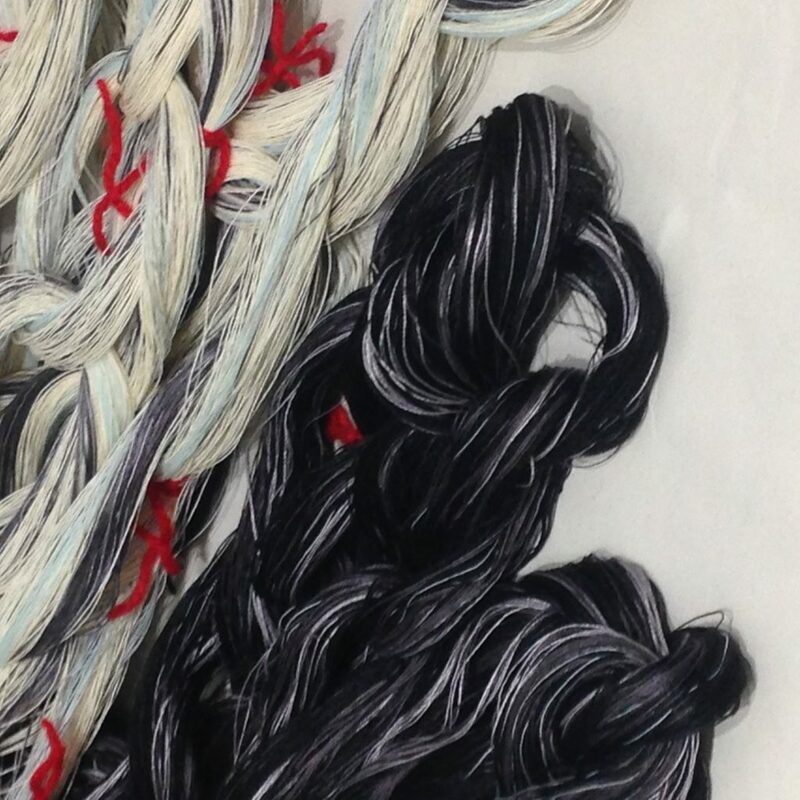 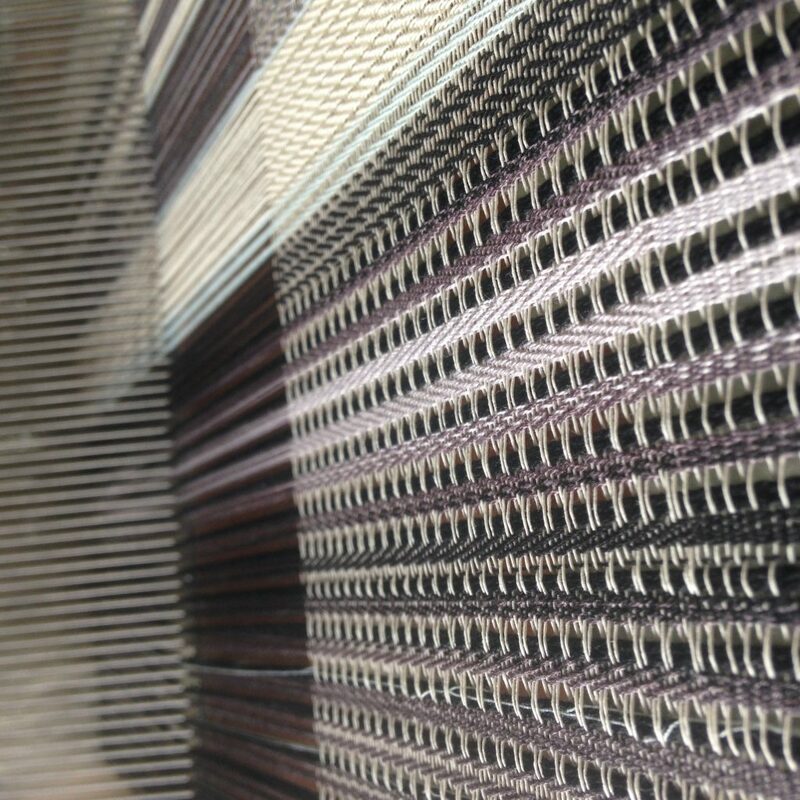 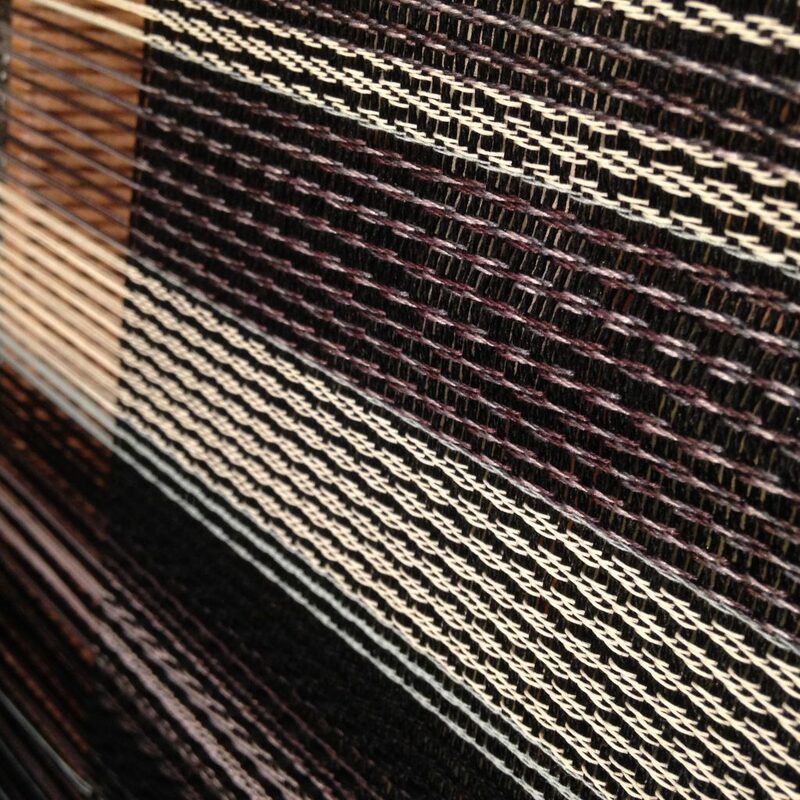 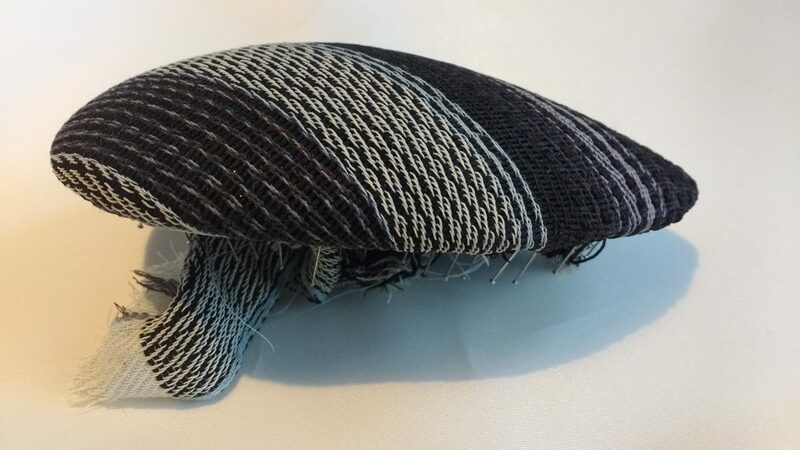 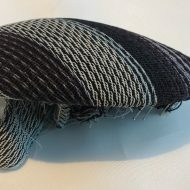 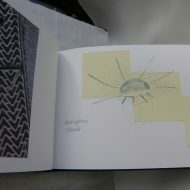 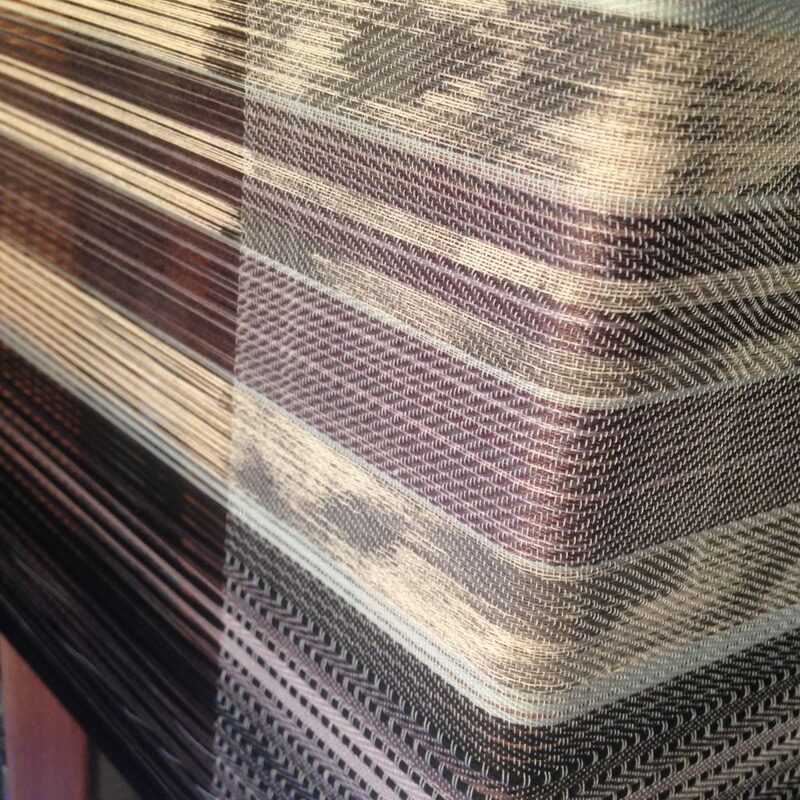 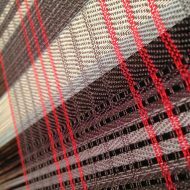 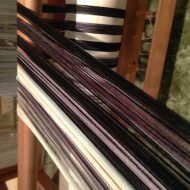 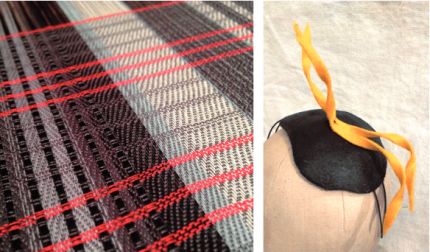 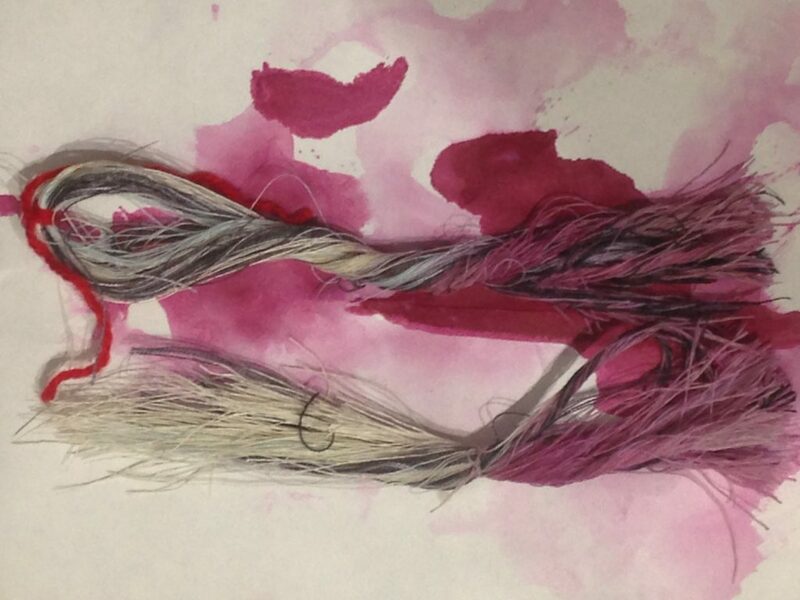 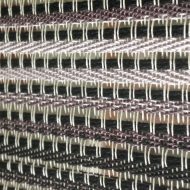 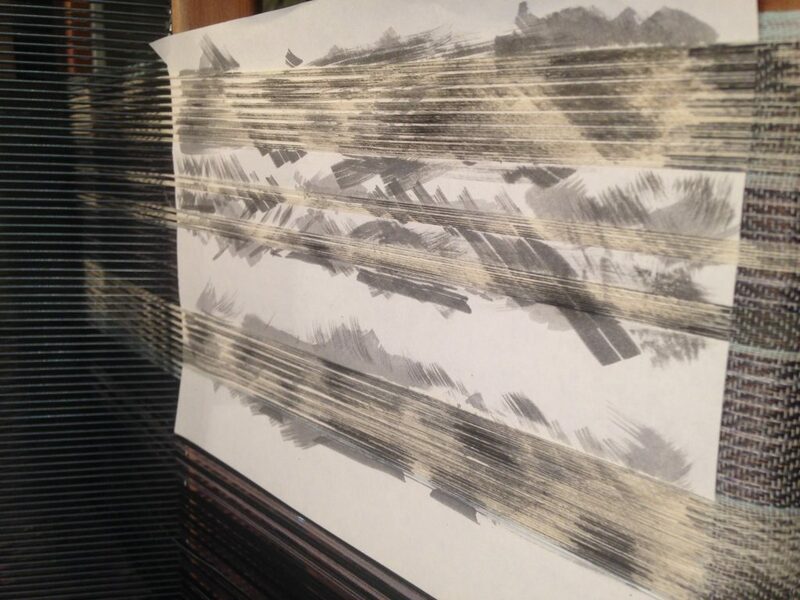 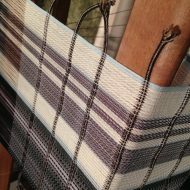 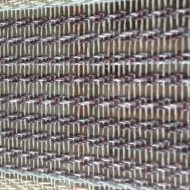 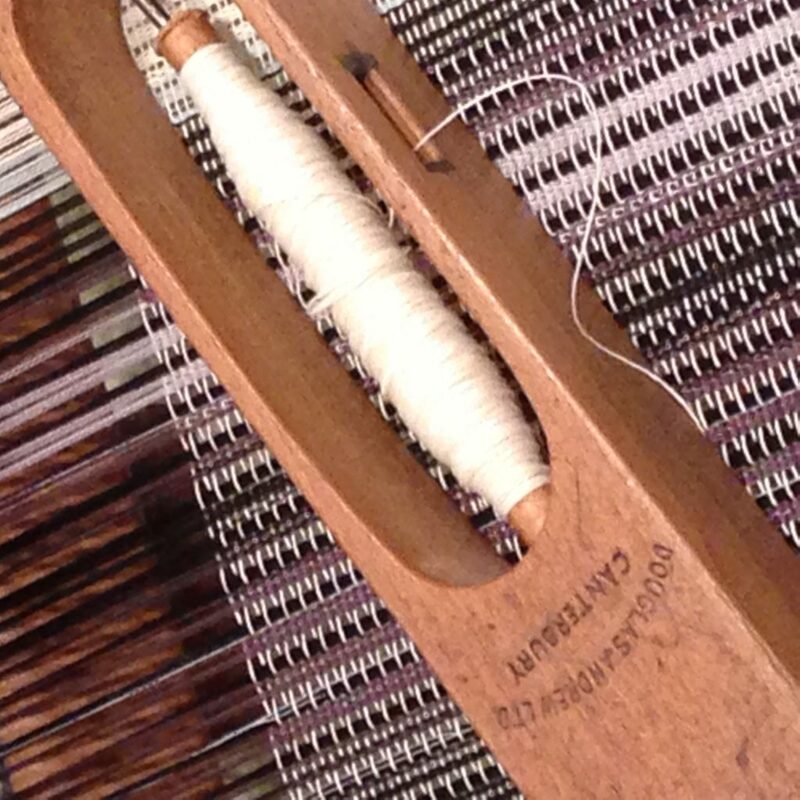 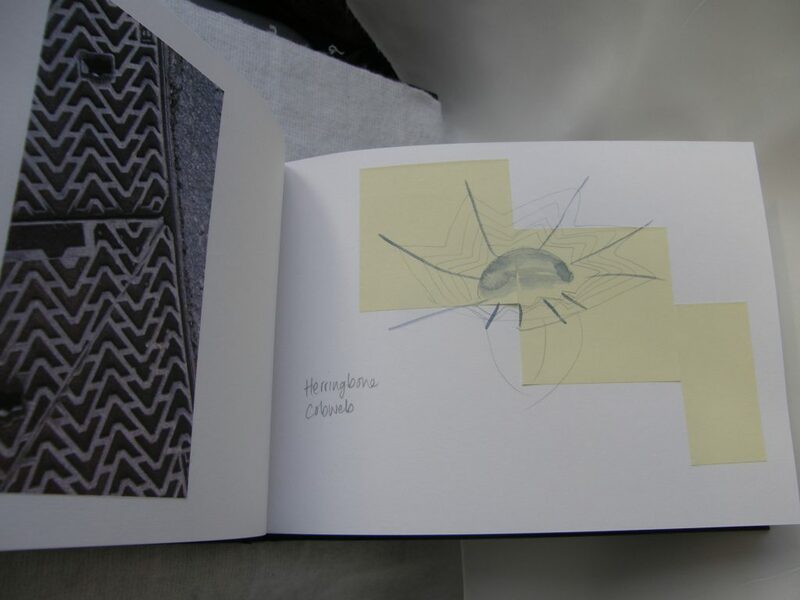 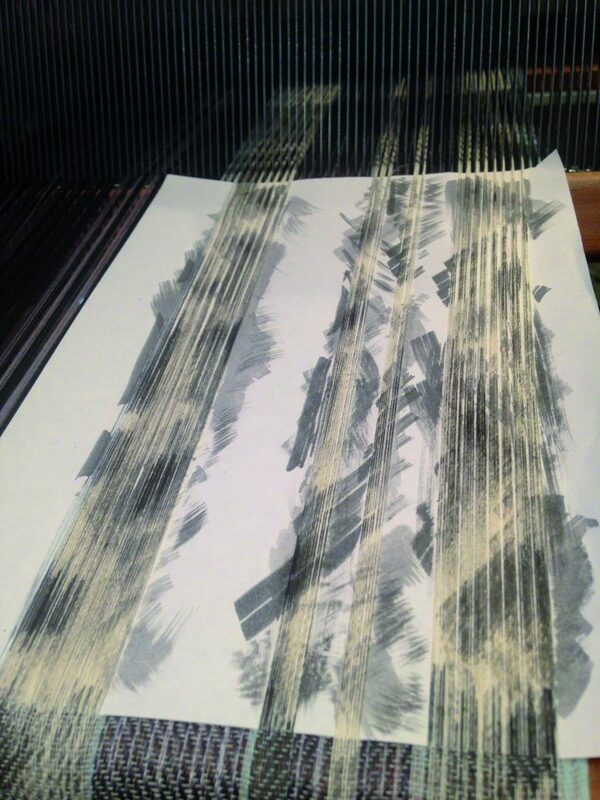 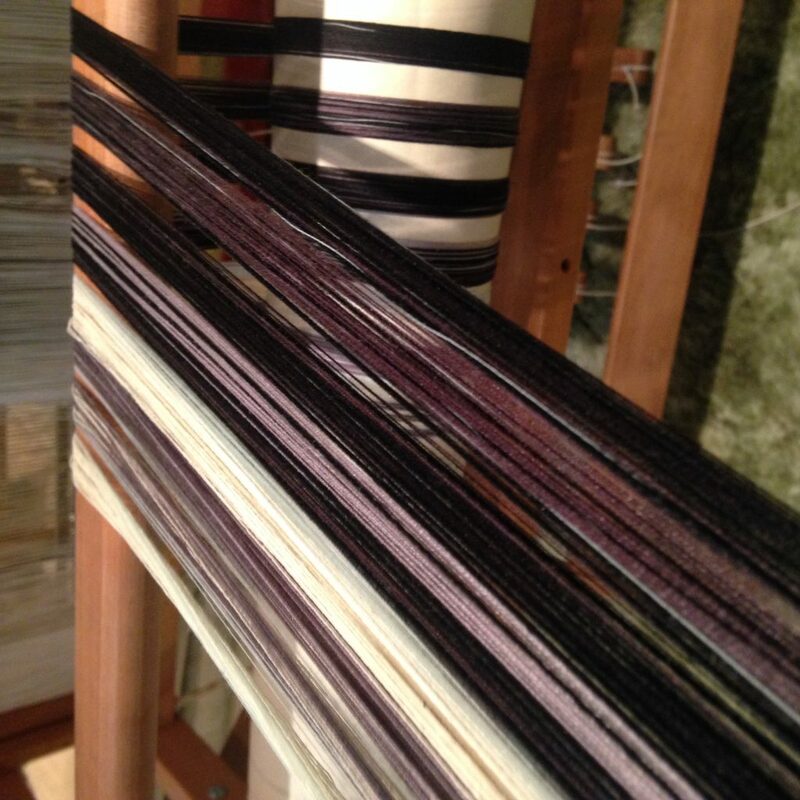 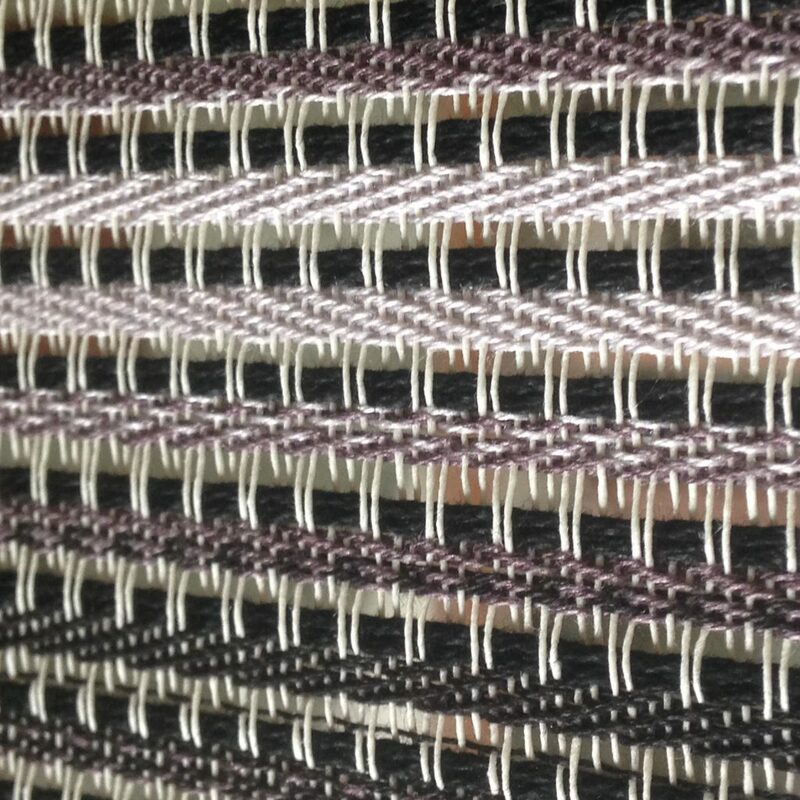 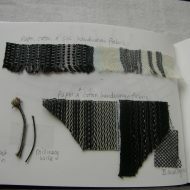 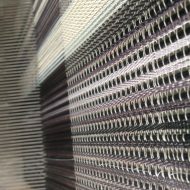 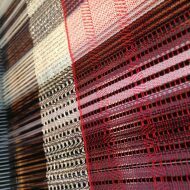 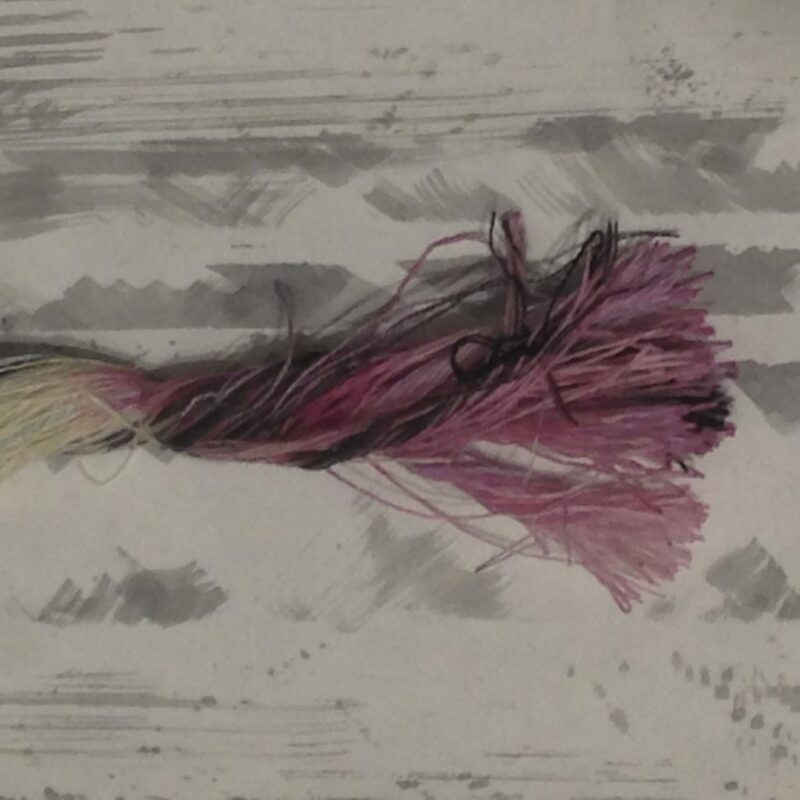 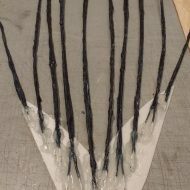 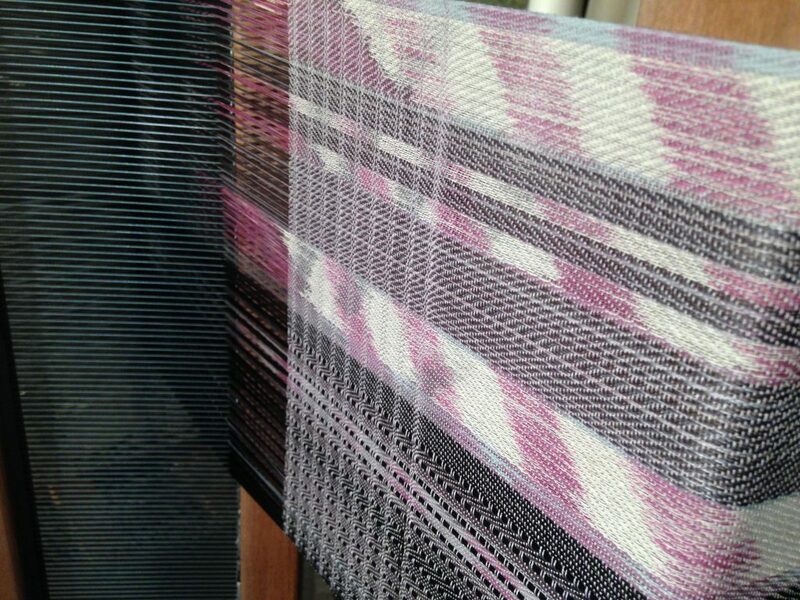 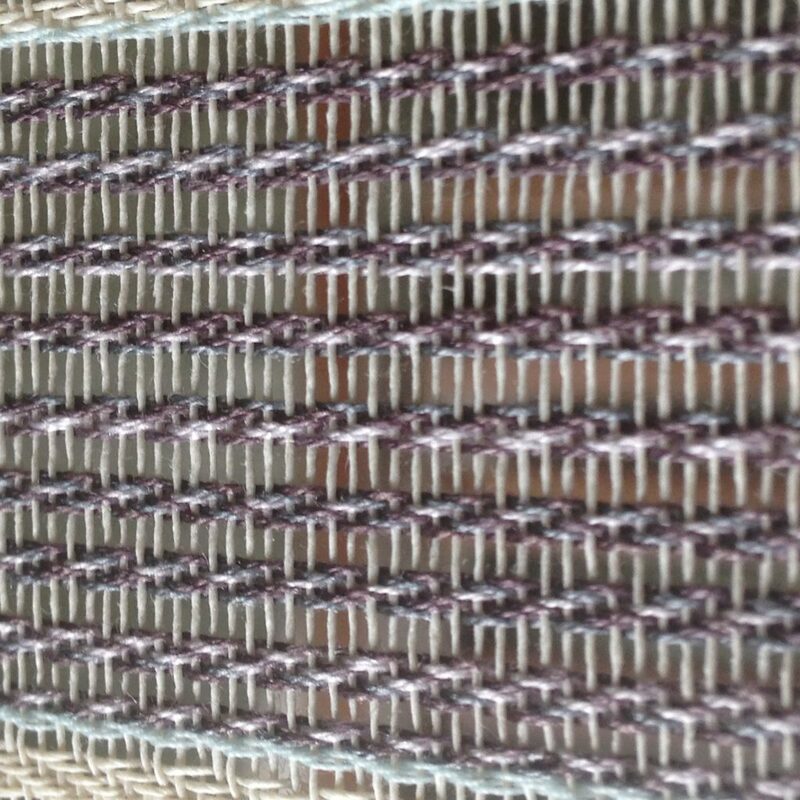 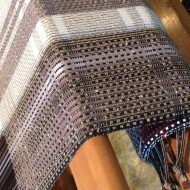 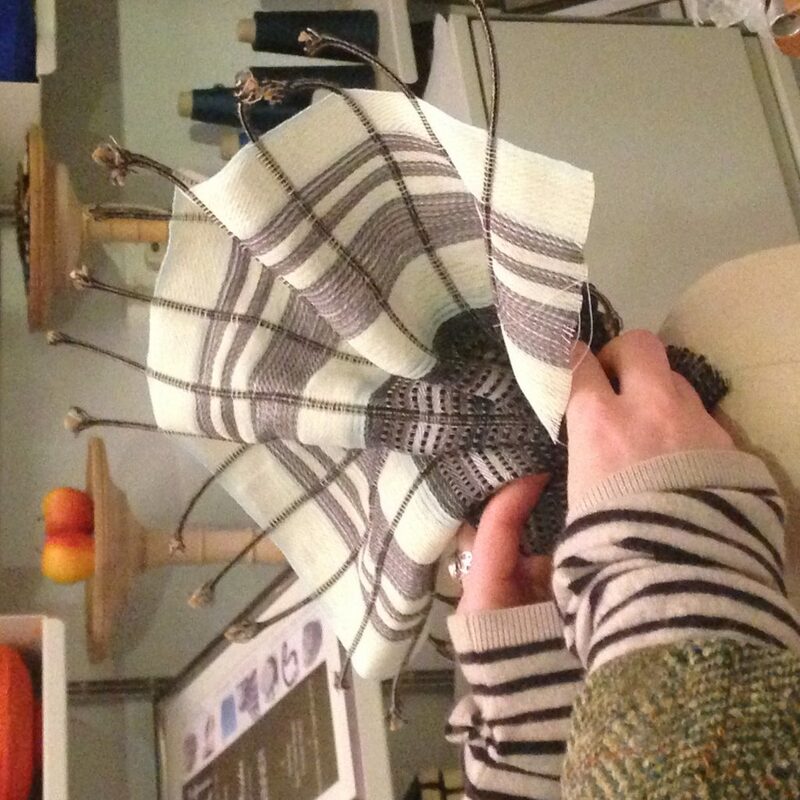 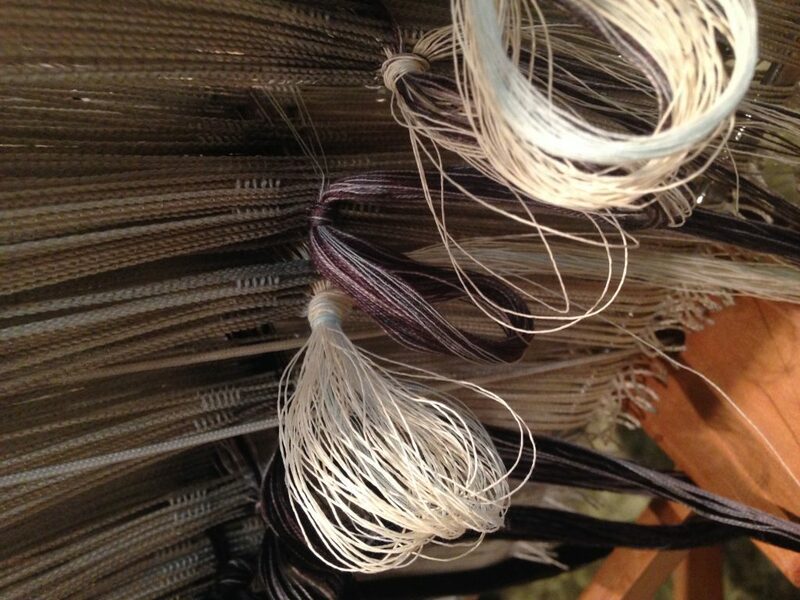 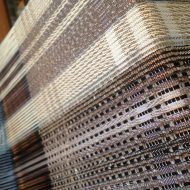 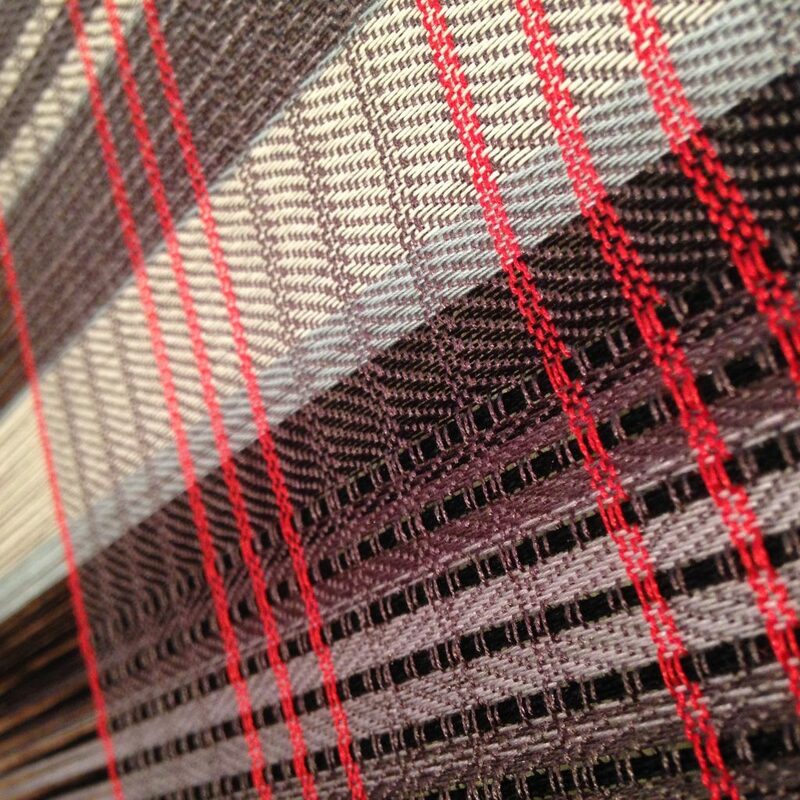 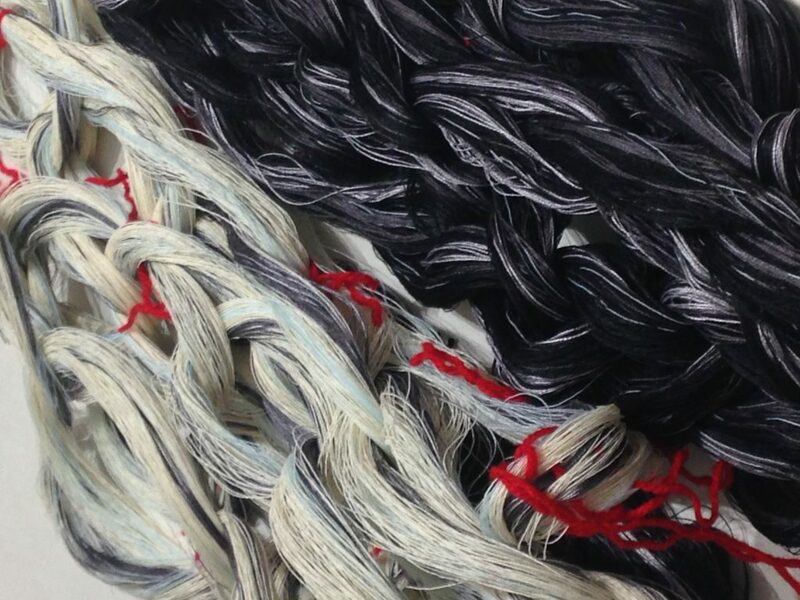 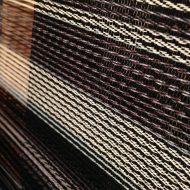 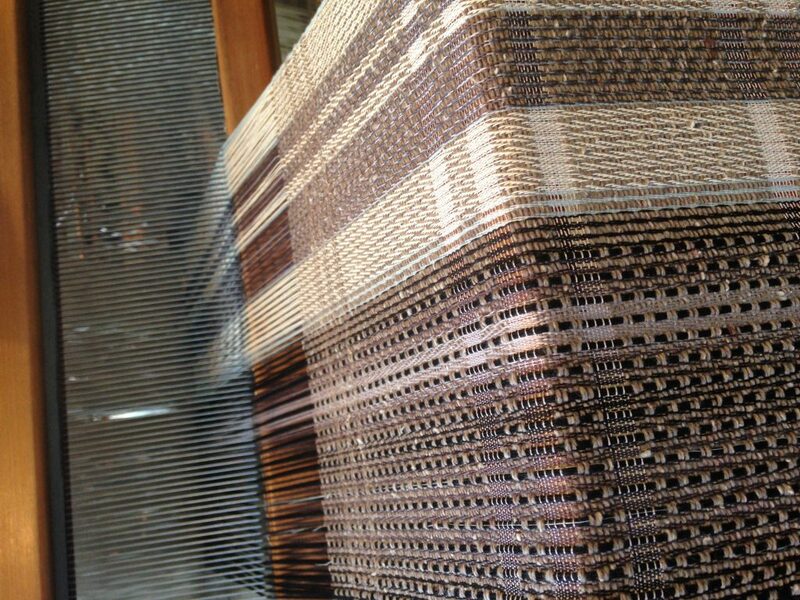 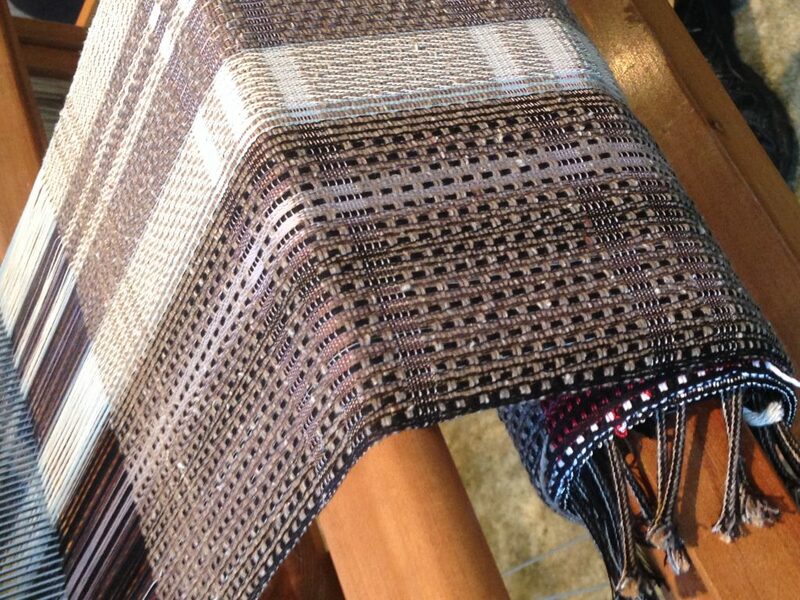 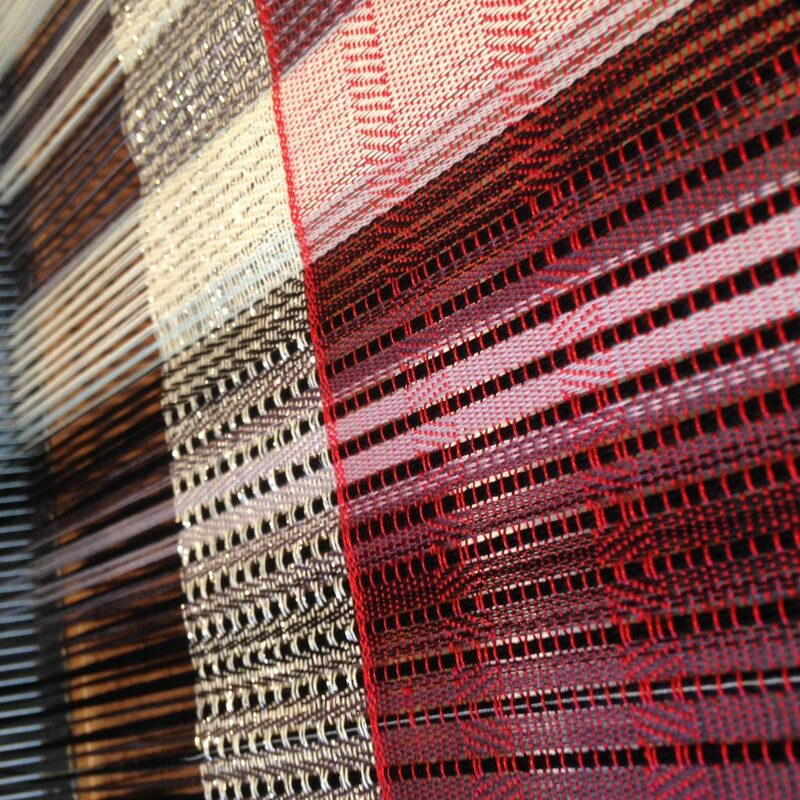 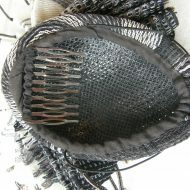 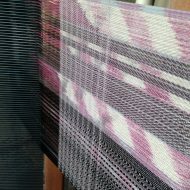 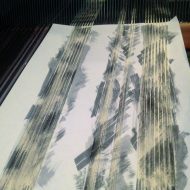 Nick’s weaving is usually orderly, structured, and neat, working with silk fibres that are soft against the skin. 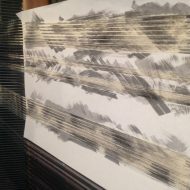 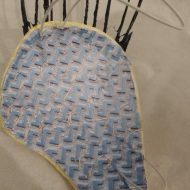 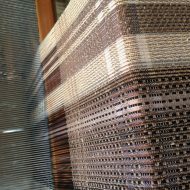 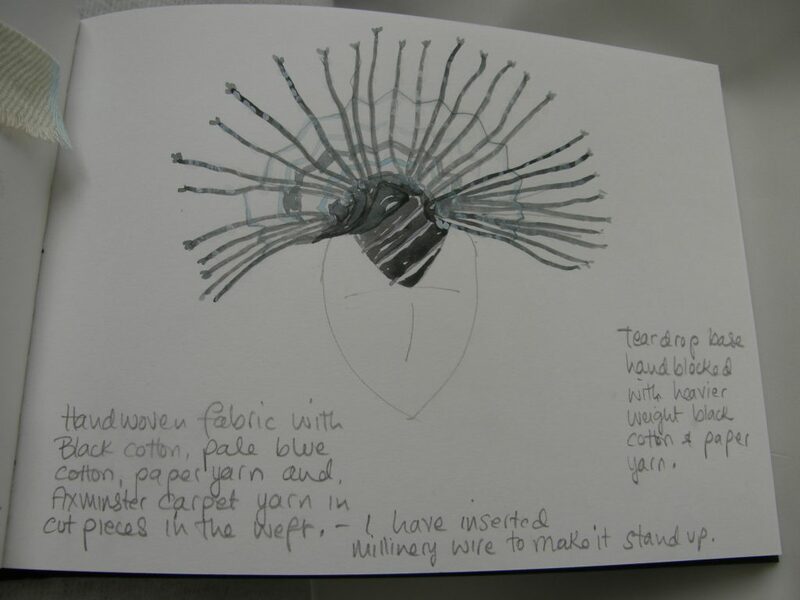 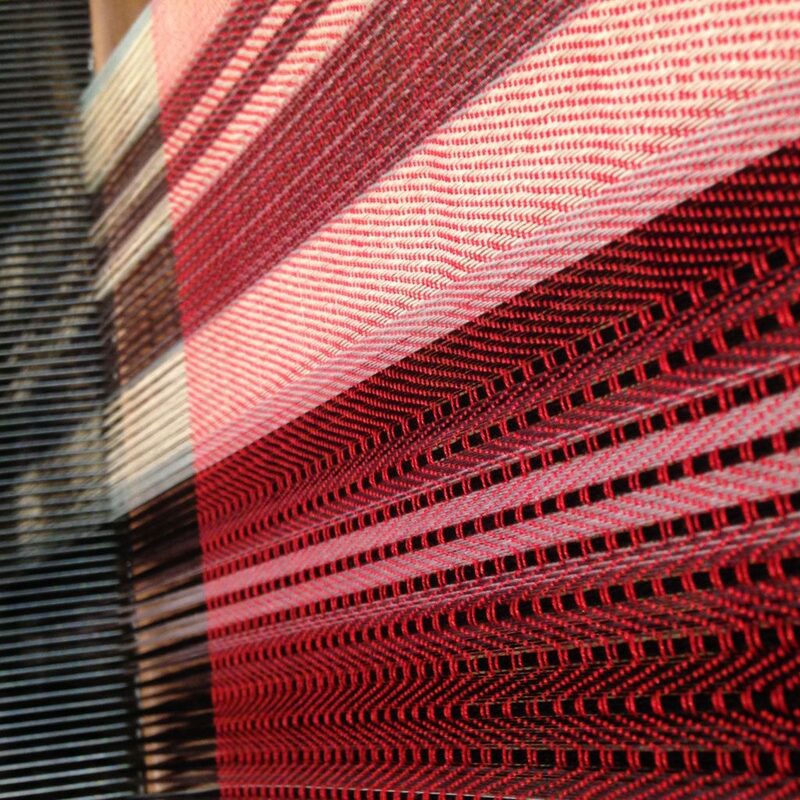 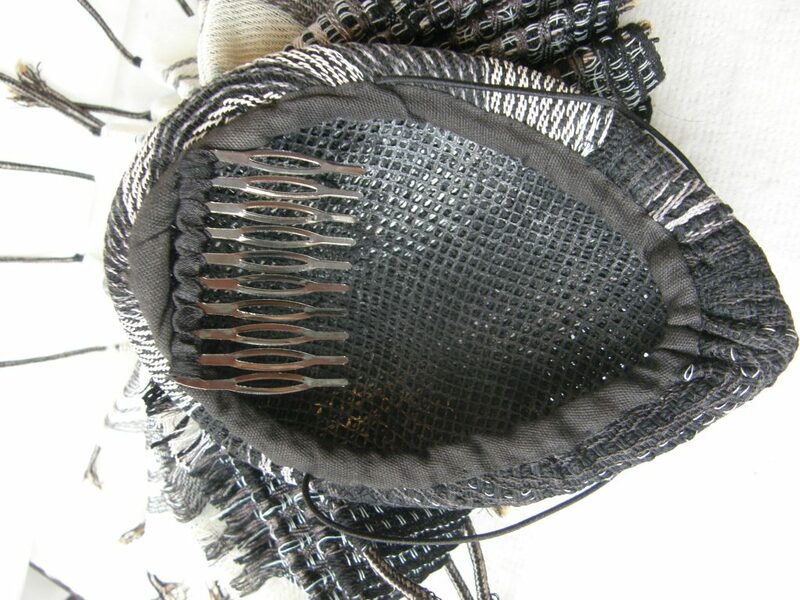 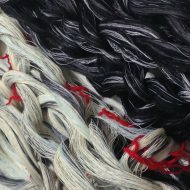 In contrast, the collaboration has seen him explore weaving with Kevlar, a fibre used in body armour andpaper yarn “which is very fine high twist paper which you can dye with ink and put on the loom”. 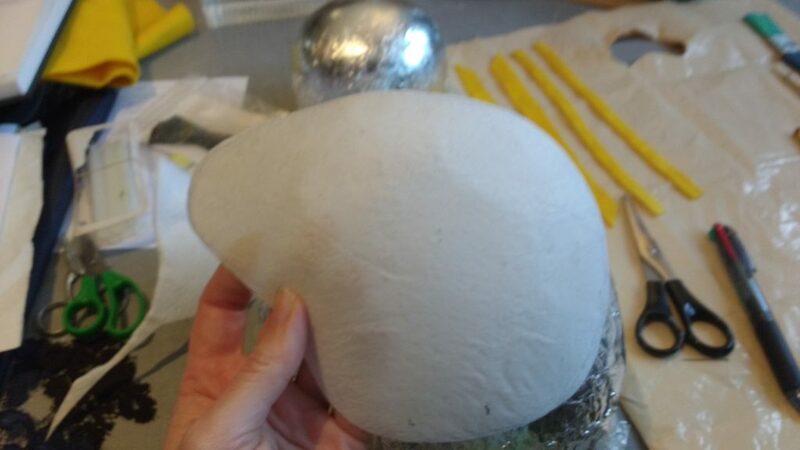 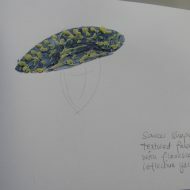 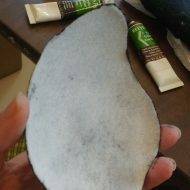 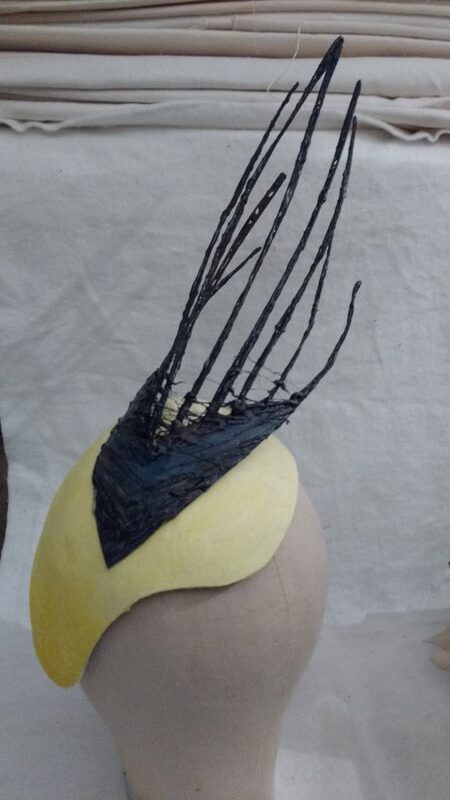 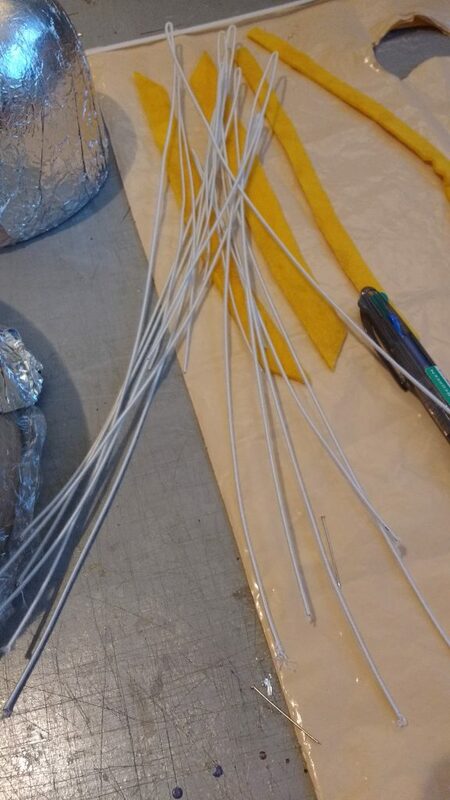 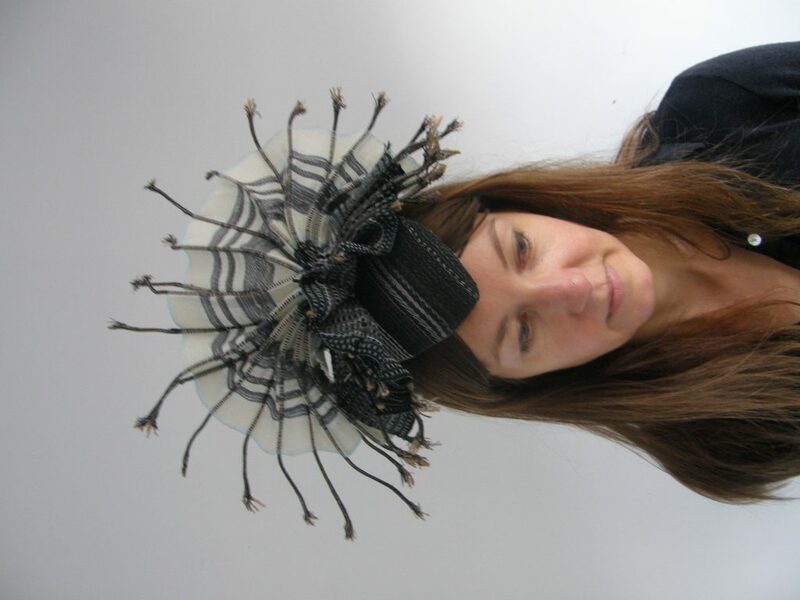 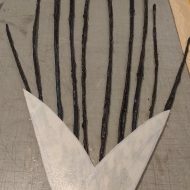 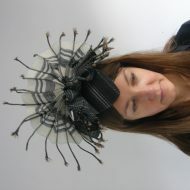 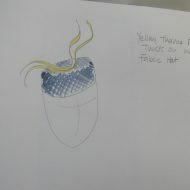 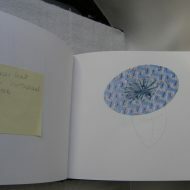 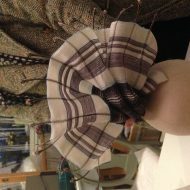 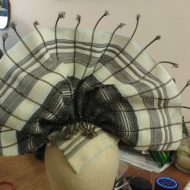 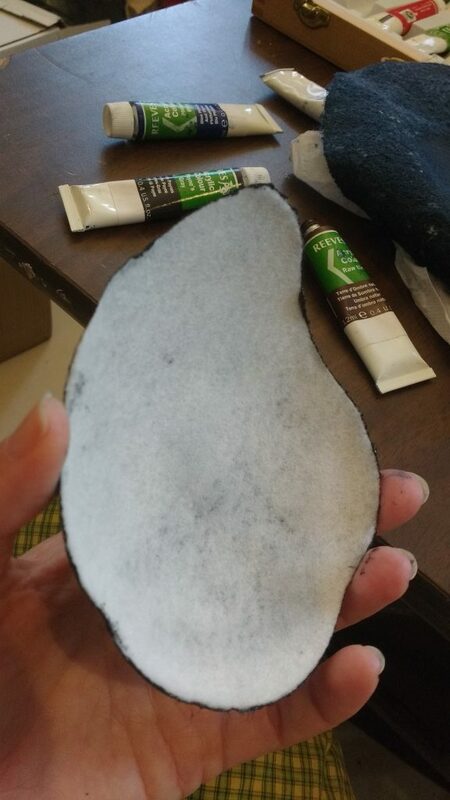 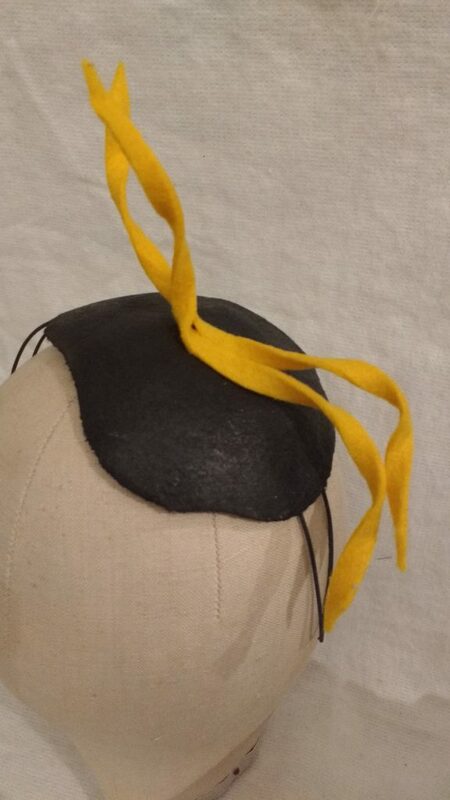 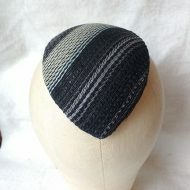 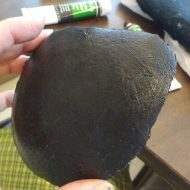 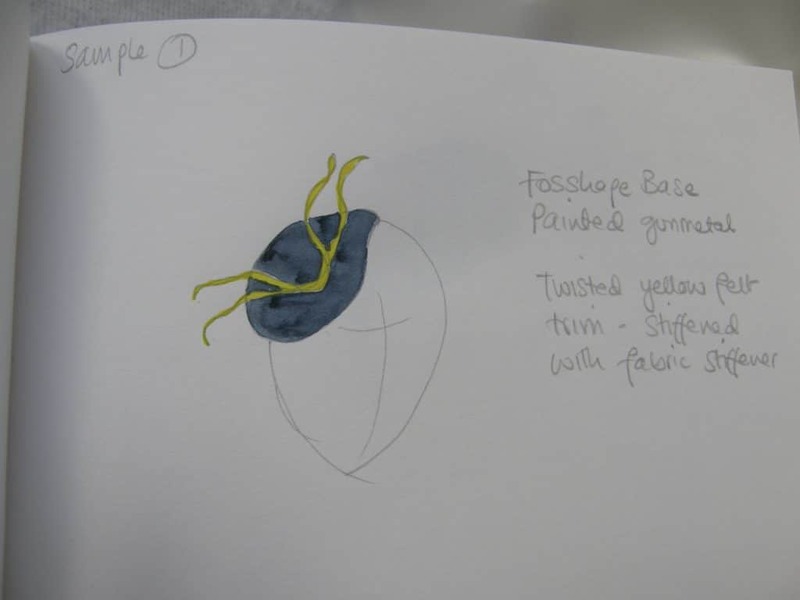 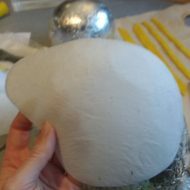 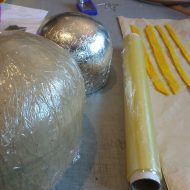 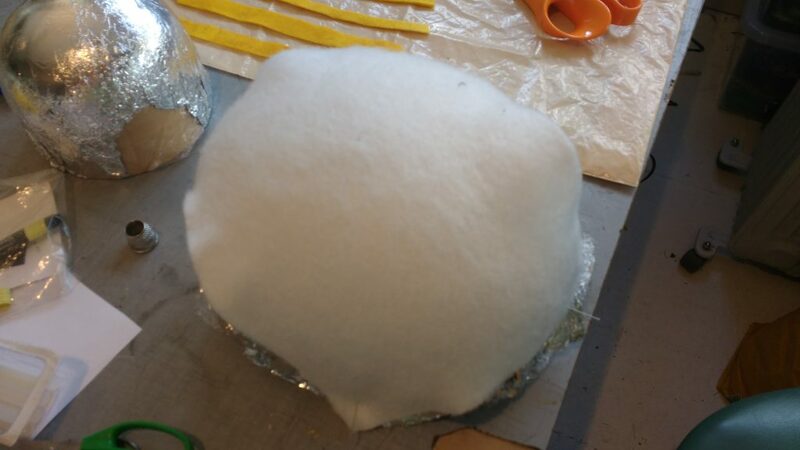 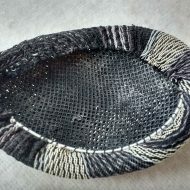 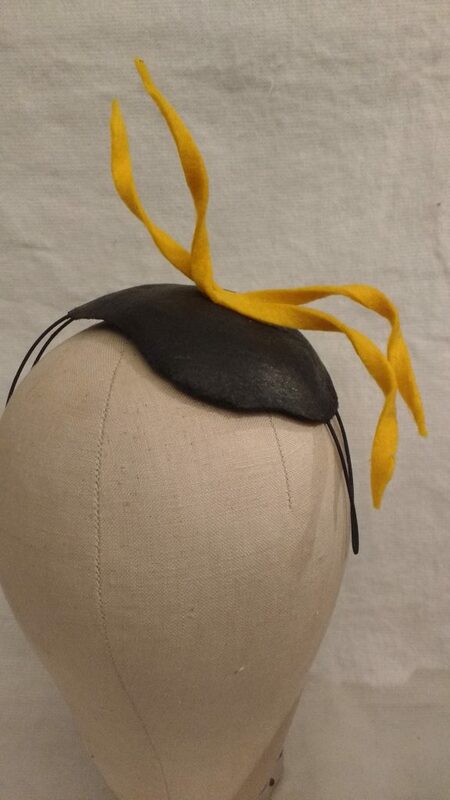 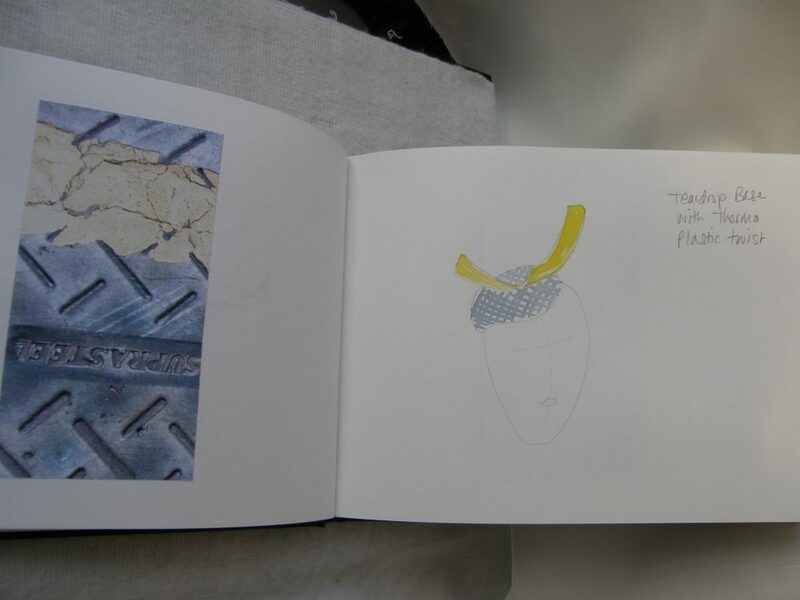 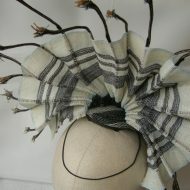 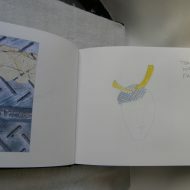 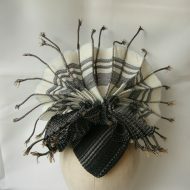 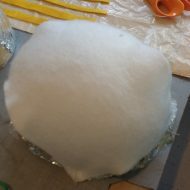 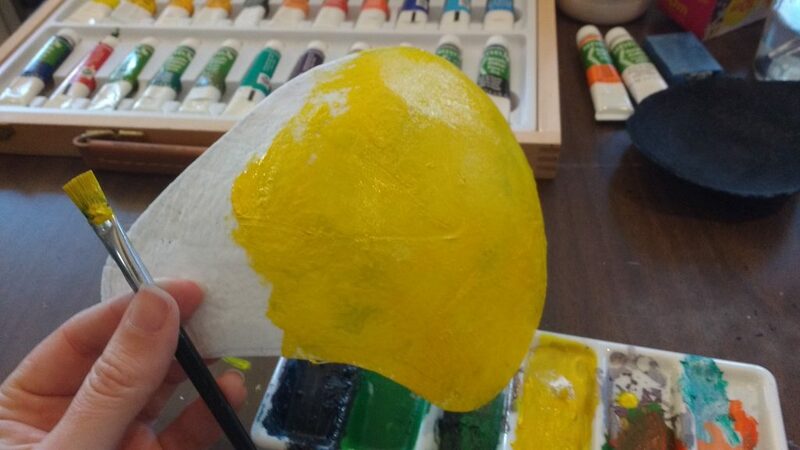 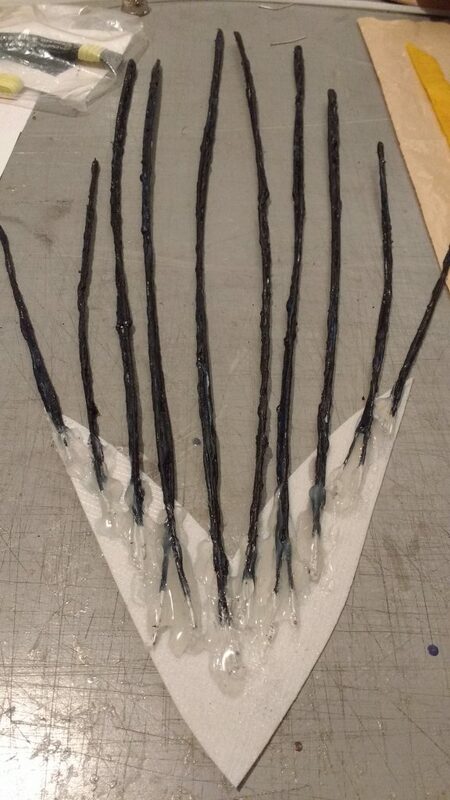 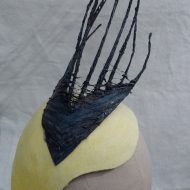 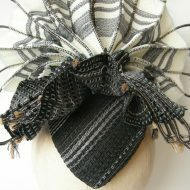 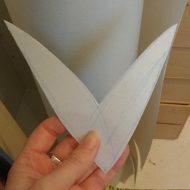 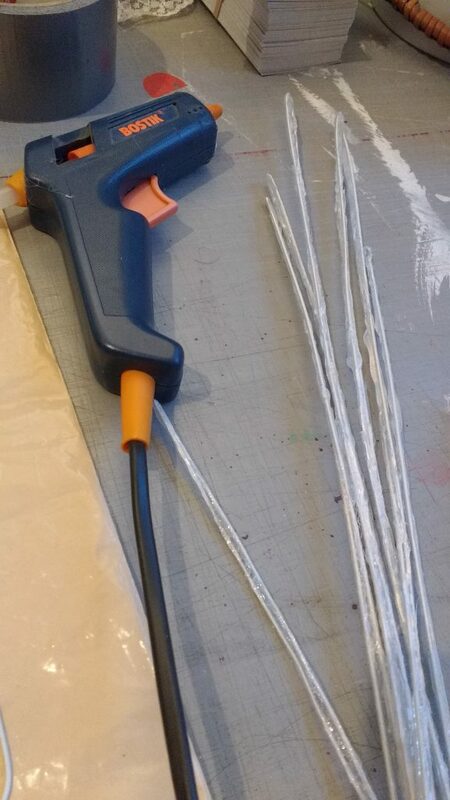 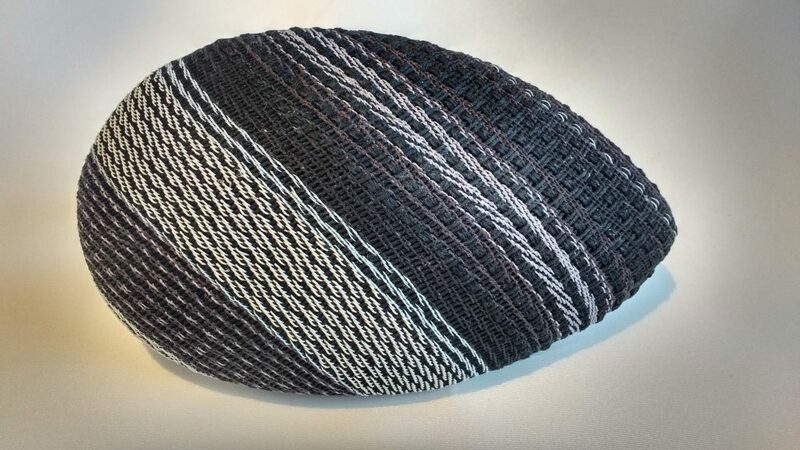 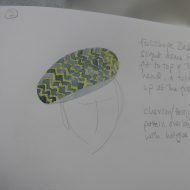 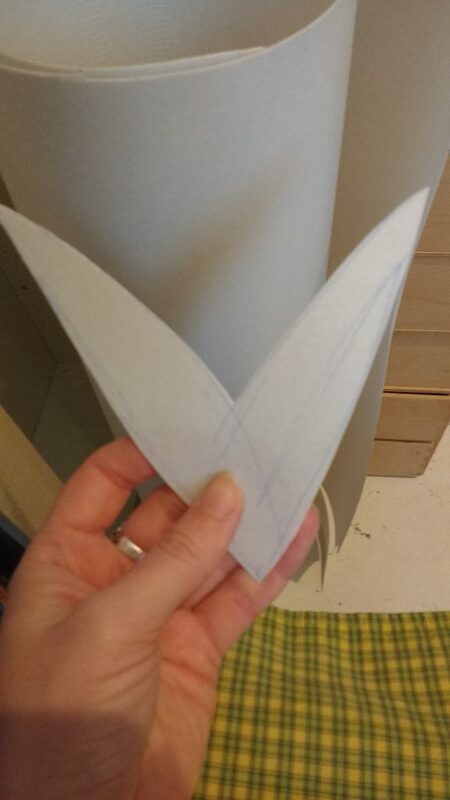 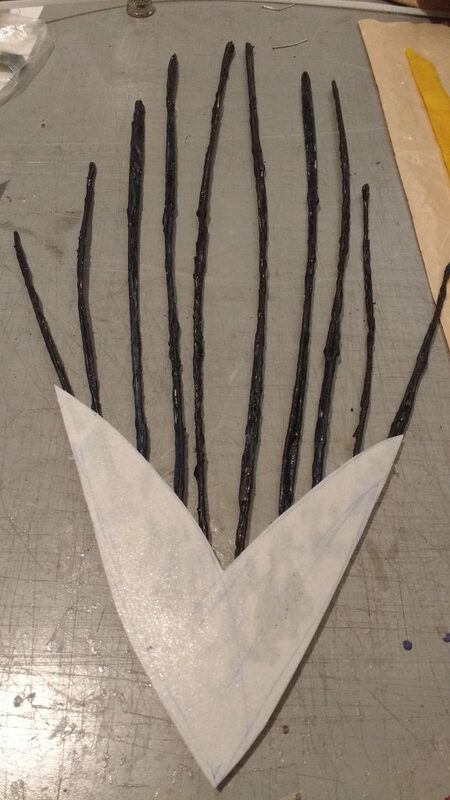 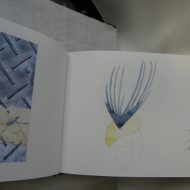 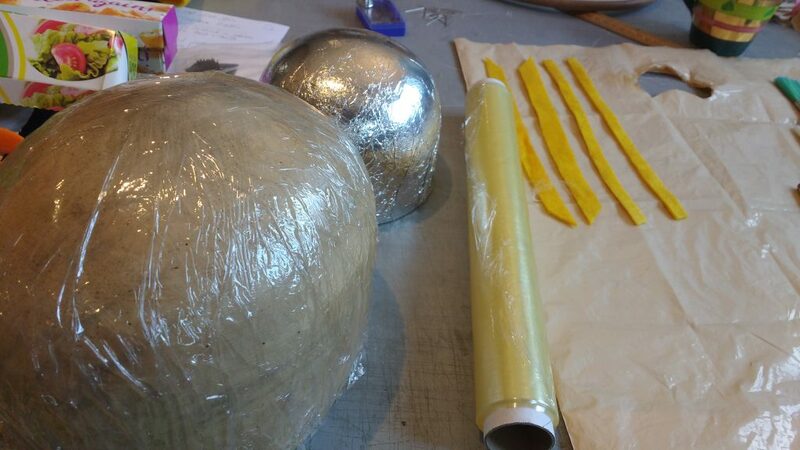 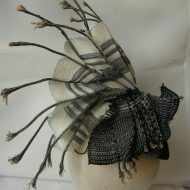 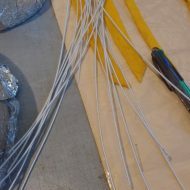 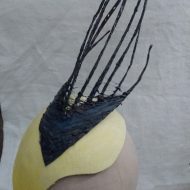 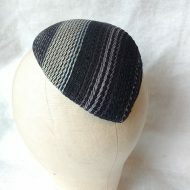 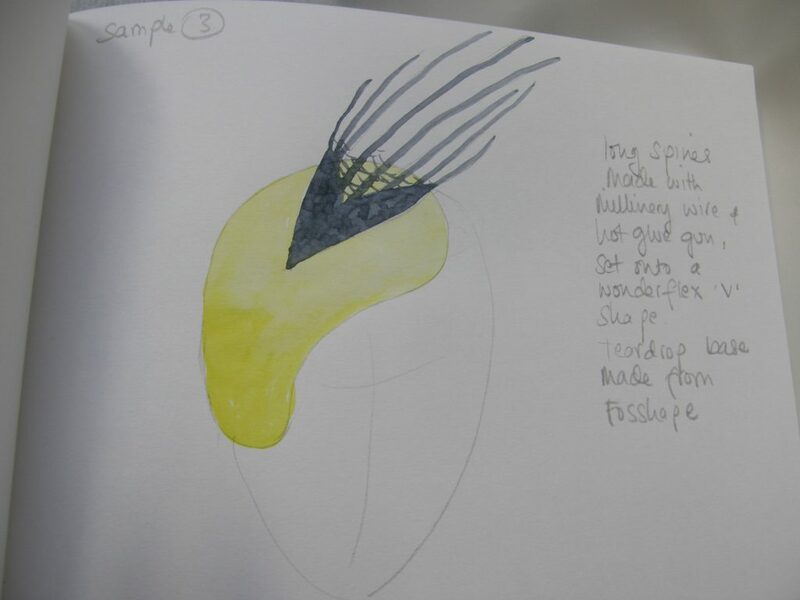 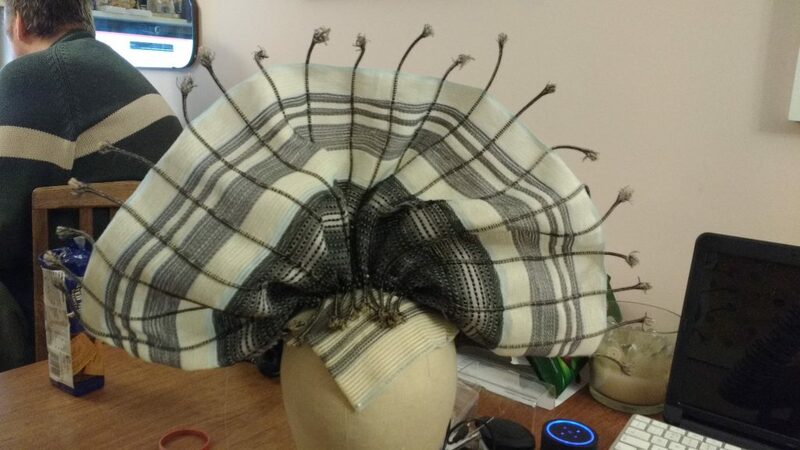 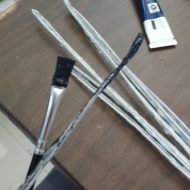 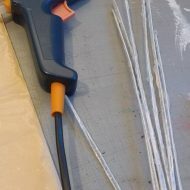 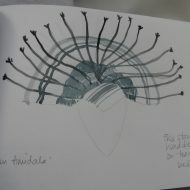 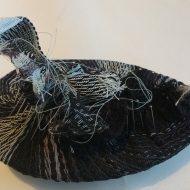 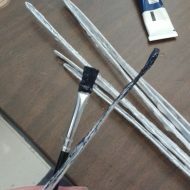 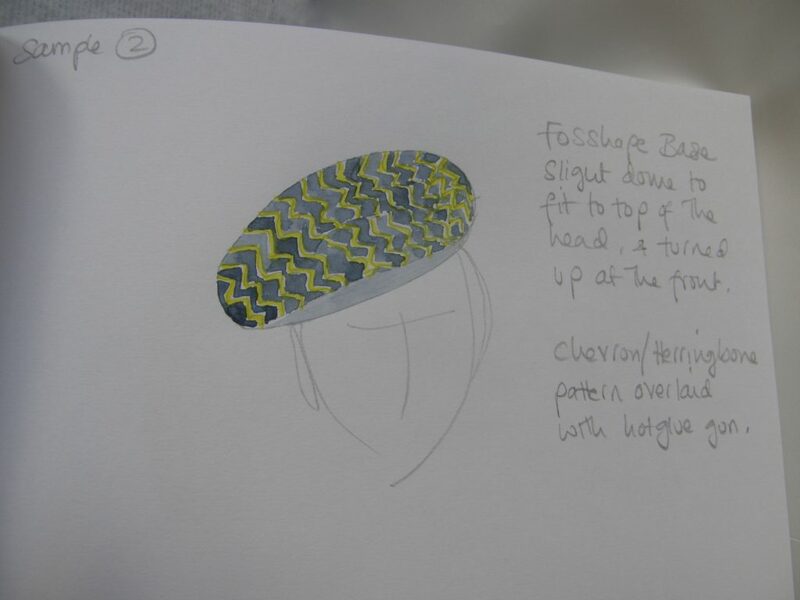 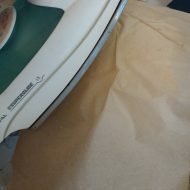 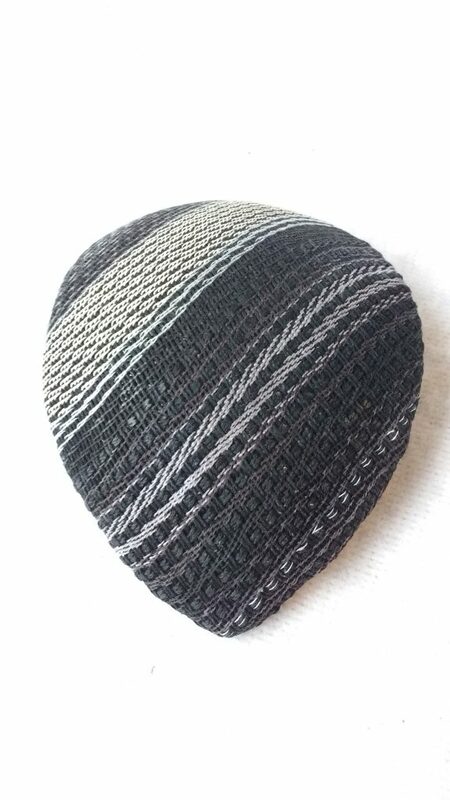 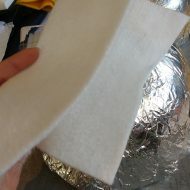 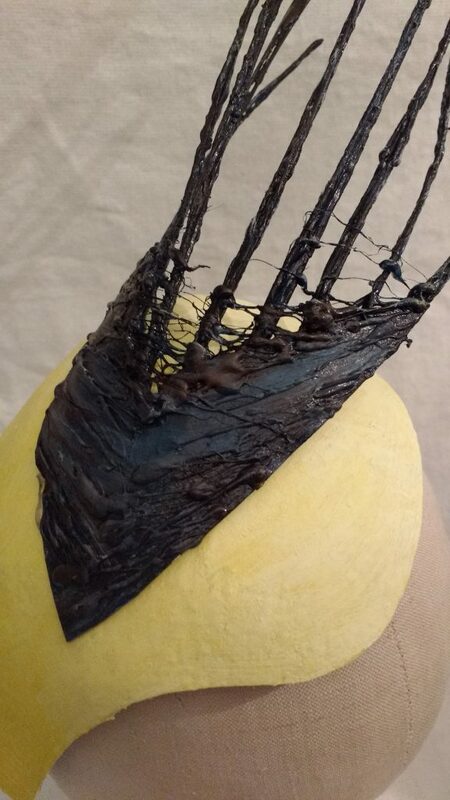 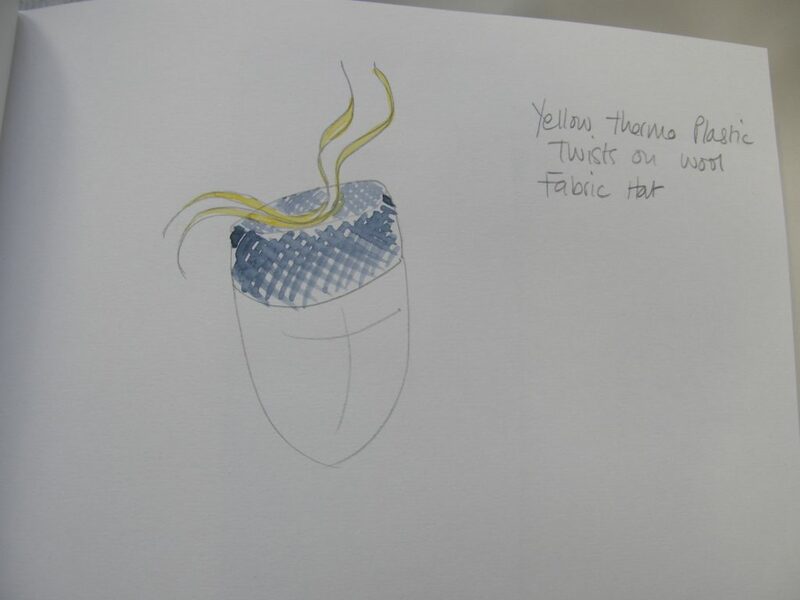 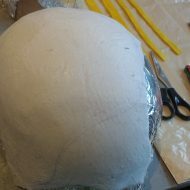 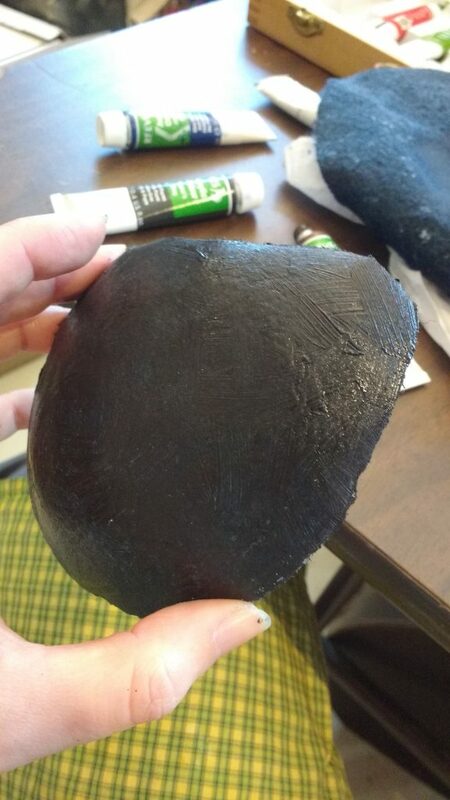 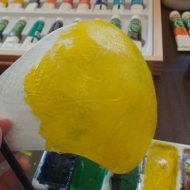 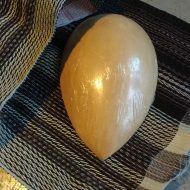 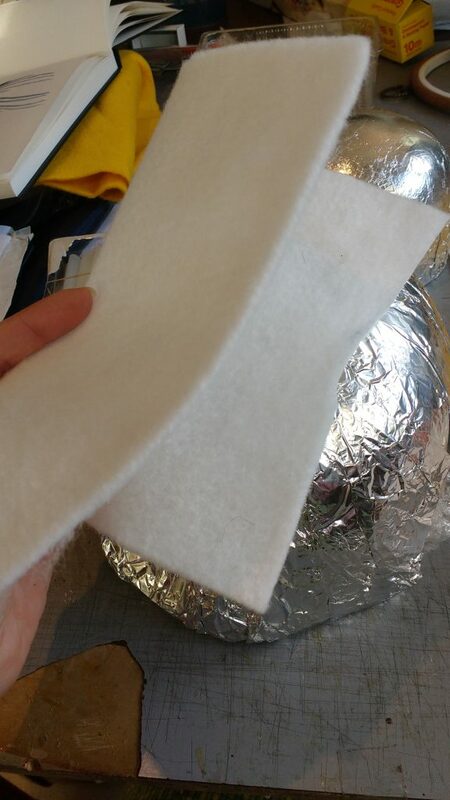 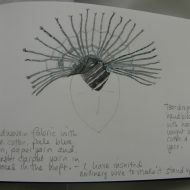 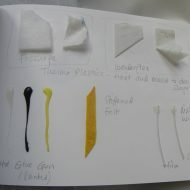 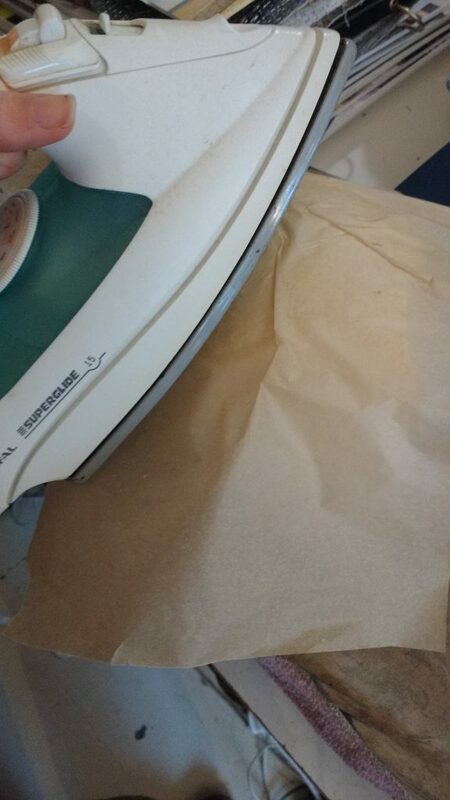 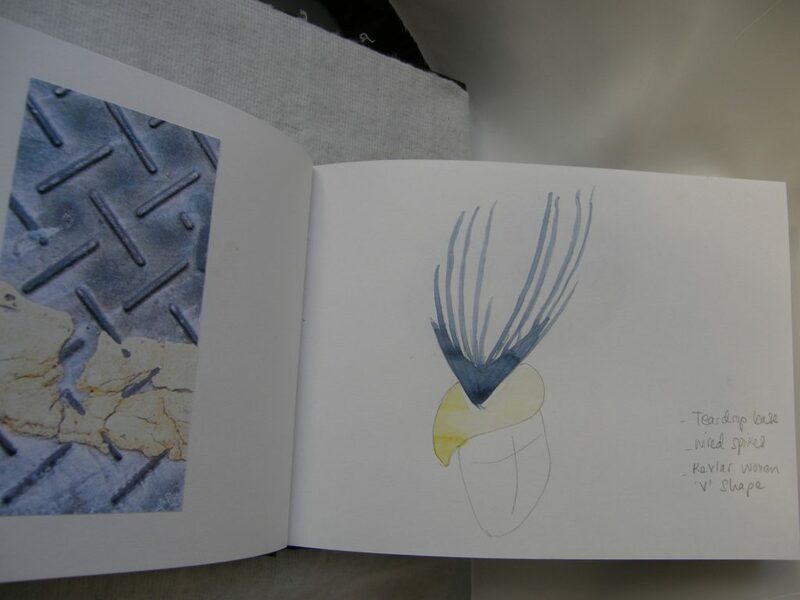 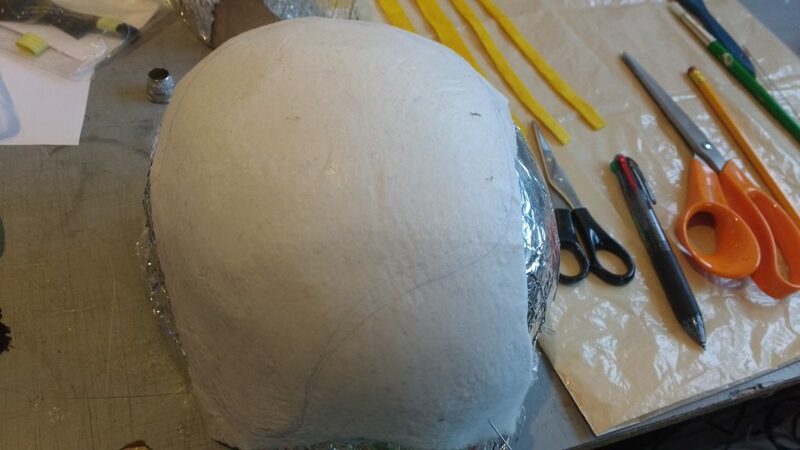 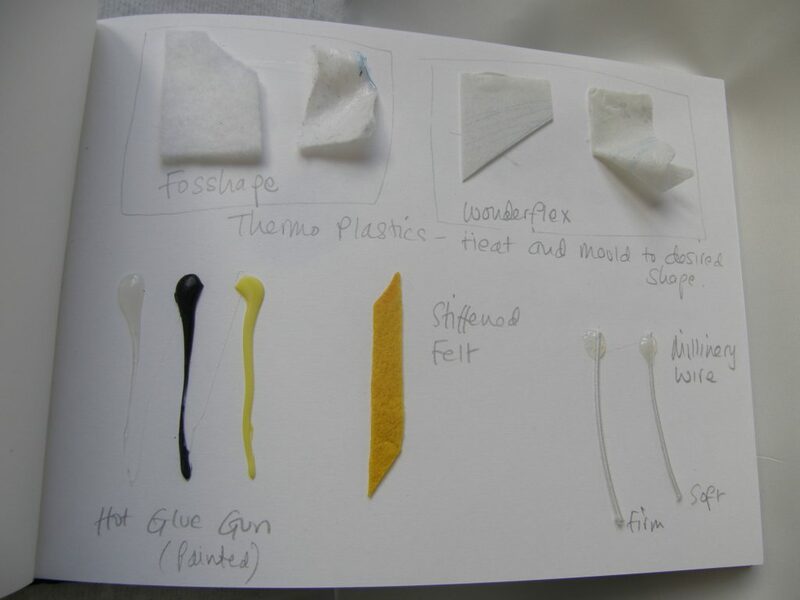 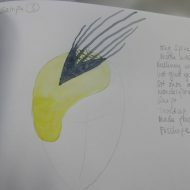 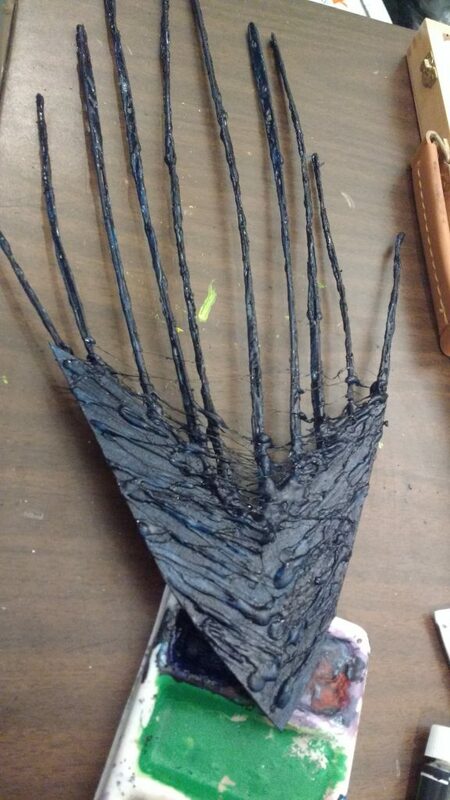 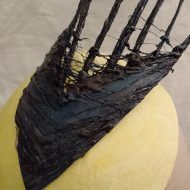 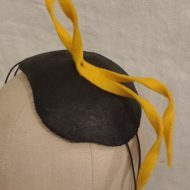 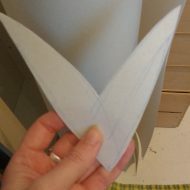 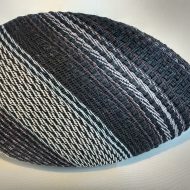 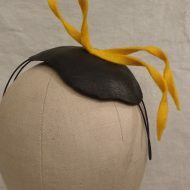 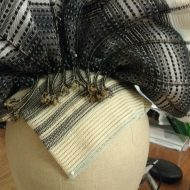 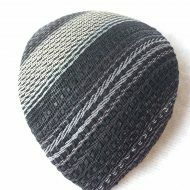 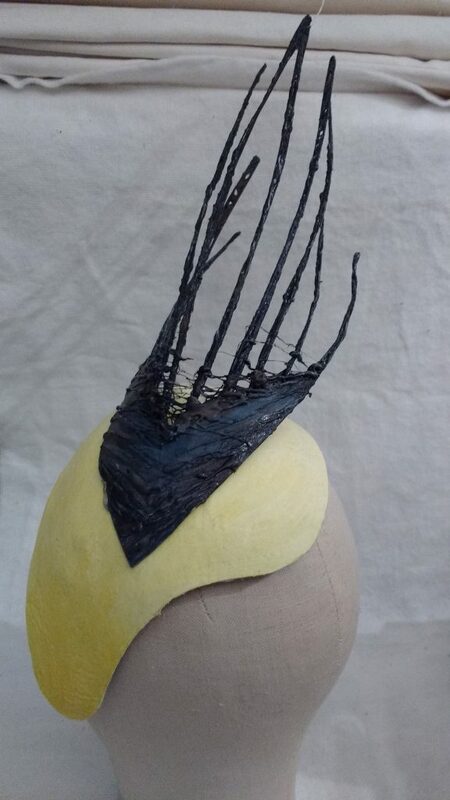 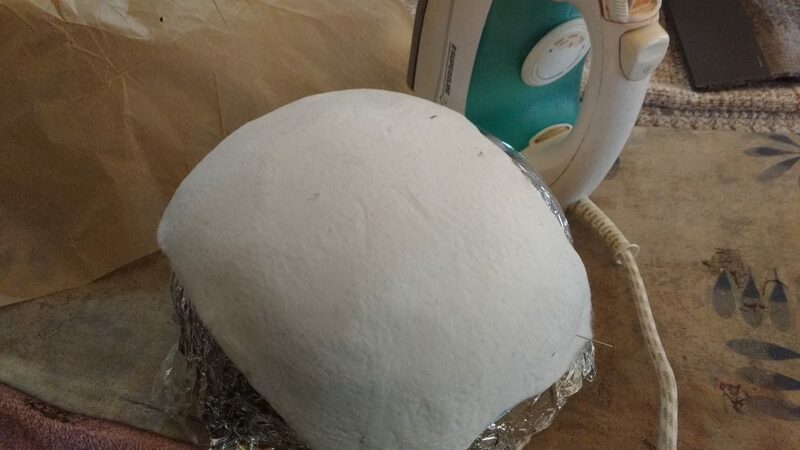 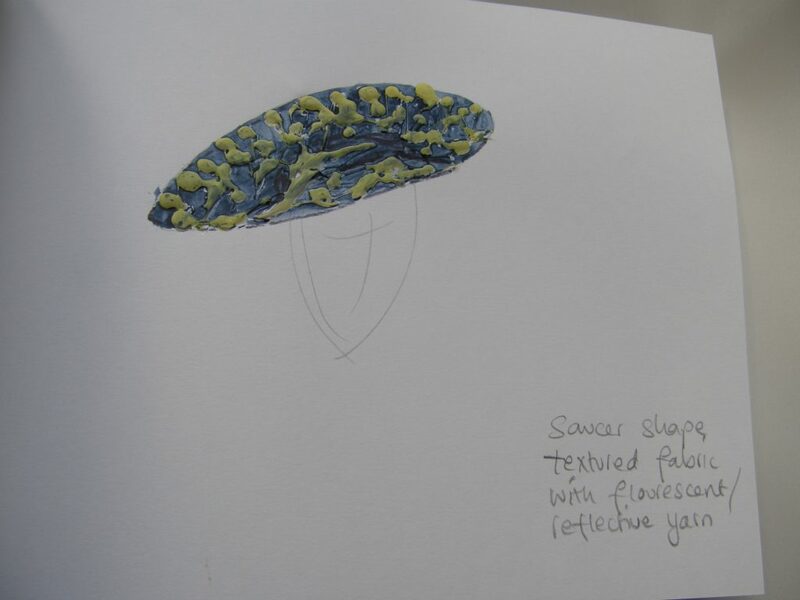 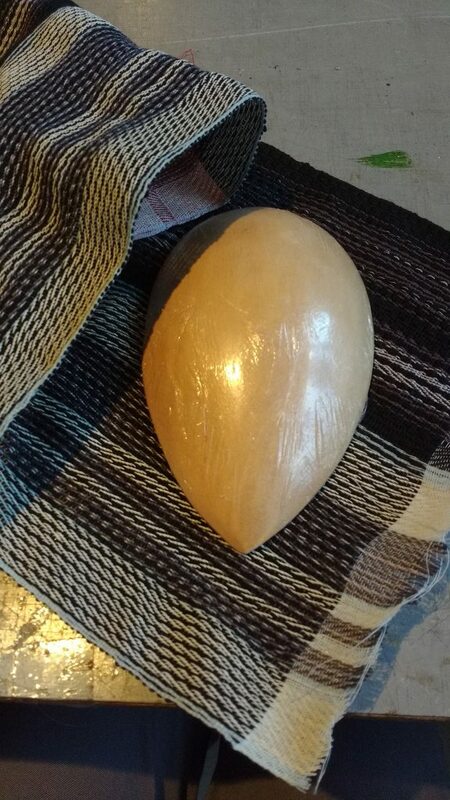 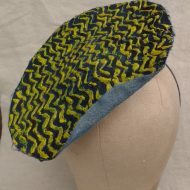 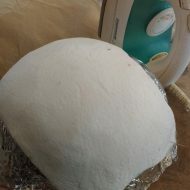 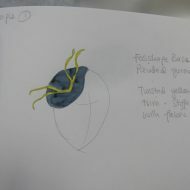 Gemma has recently expanded her practice to include millinery techniques, and has been experimenting with thermoplastics that can be heated and moulded. 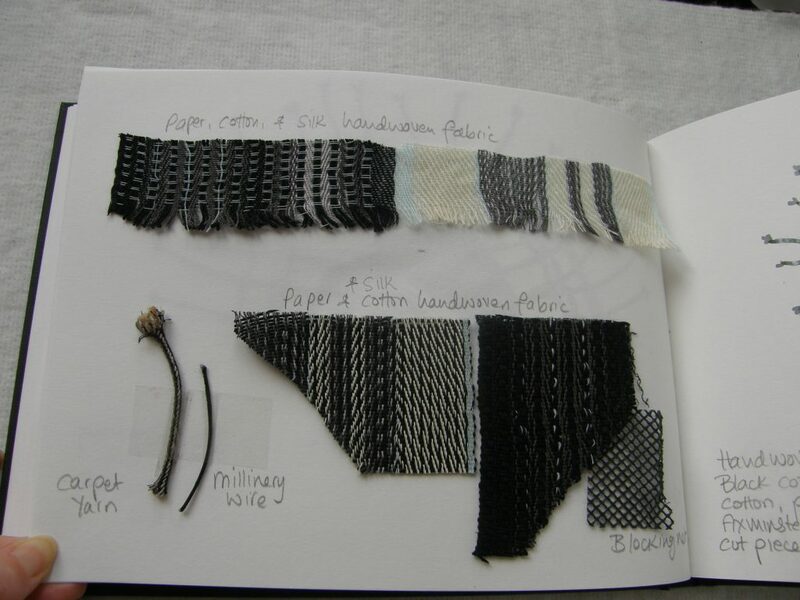 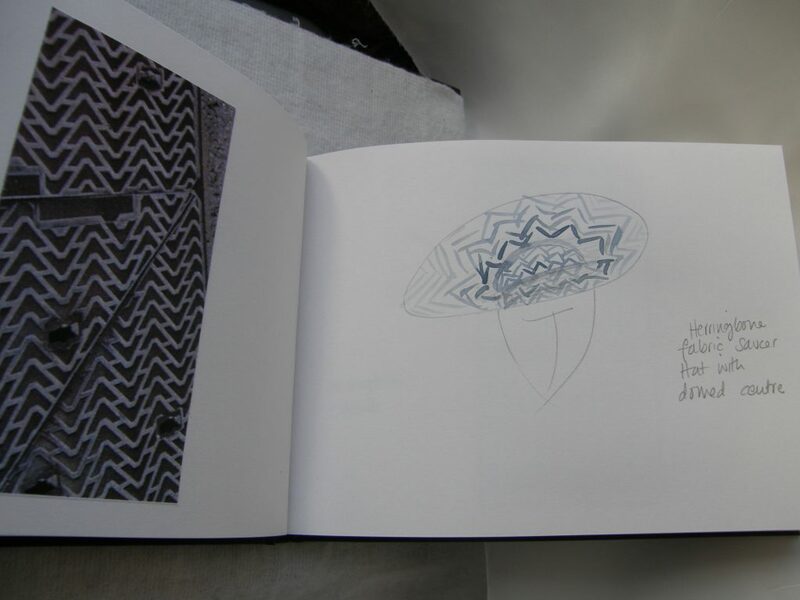 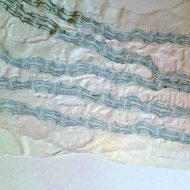 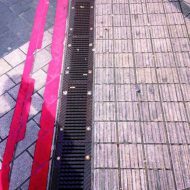 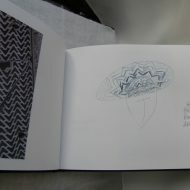 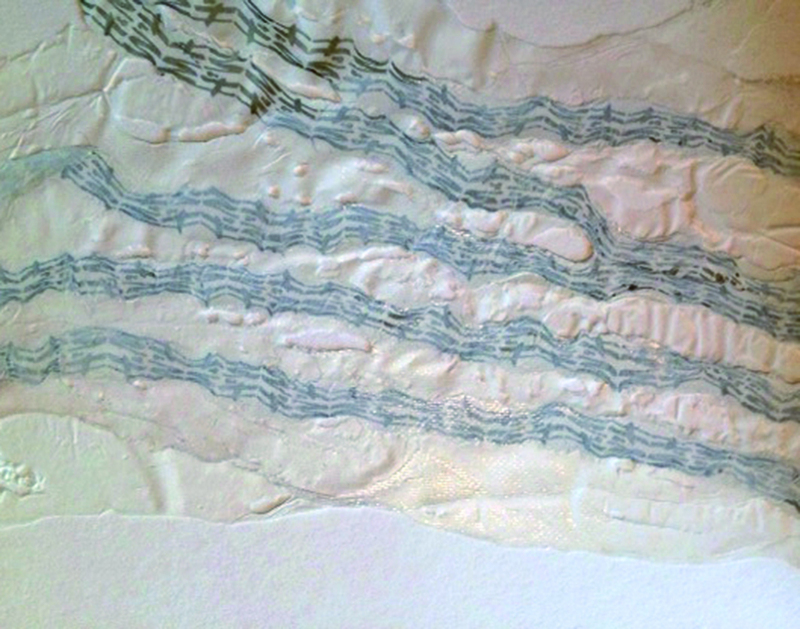 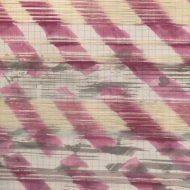 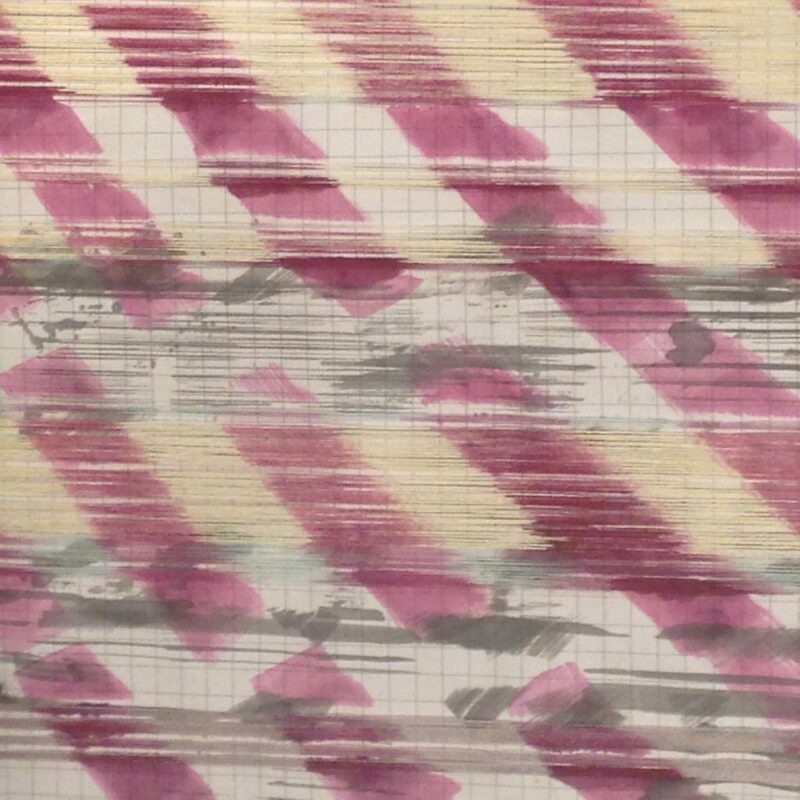 Her trial fabrications have explored the forms through which she and Nick can fuse their shared inspiration from the urban streets and Nick’s new woven material. 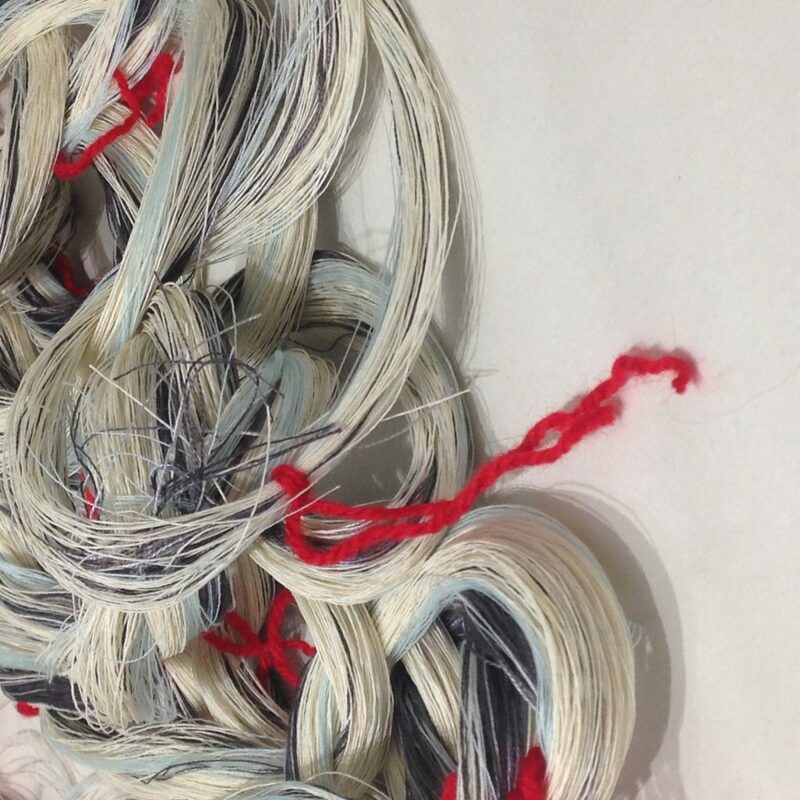 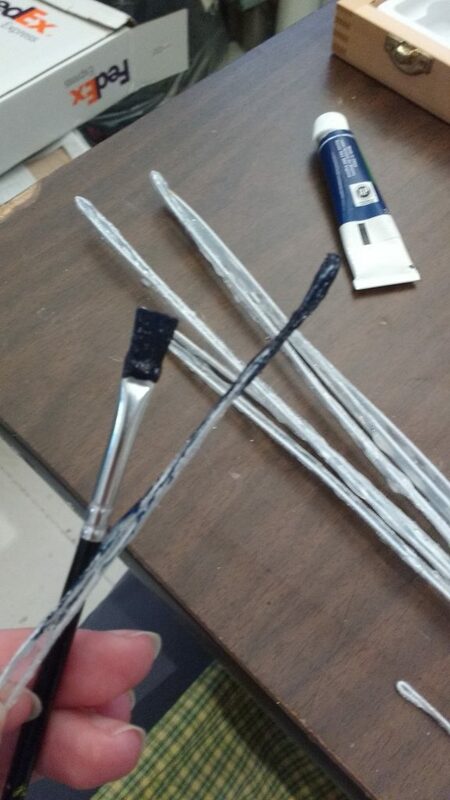 The mantra for their collaboration is ‘have we been messy enough?’. 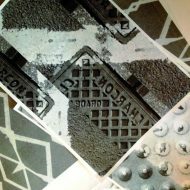 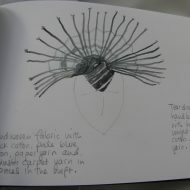 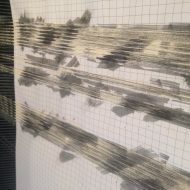 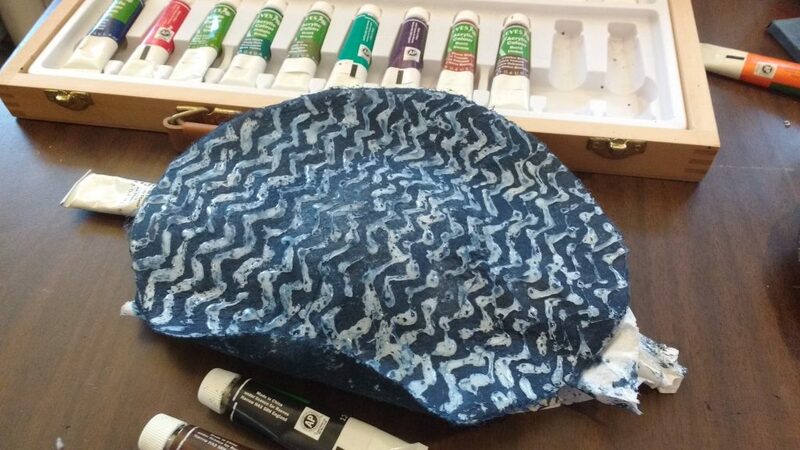 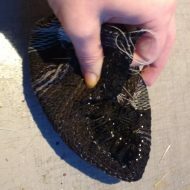 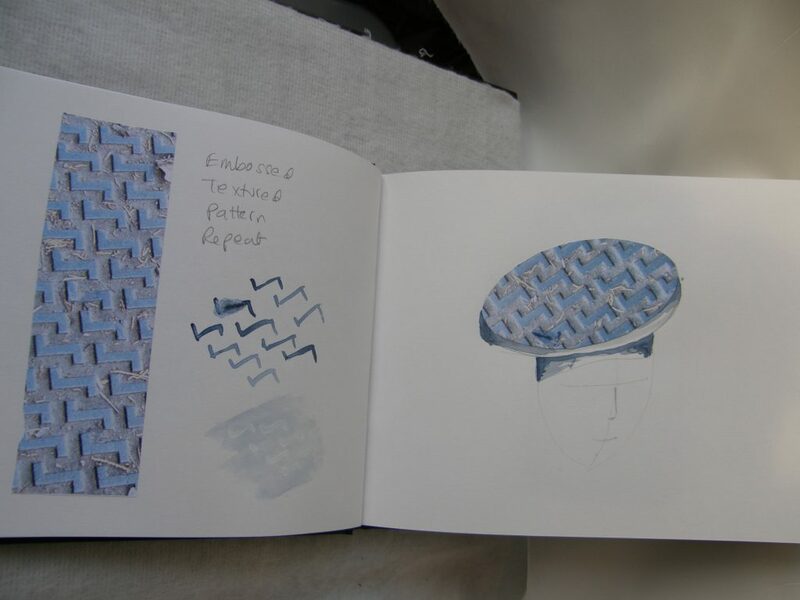 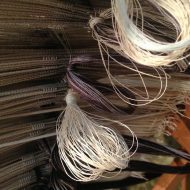 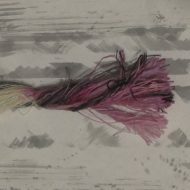 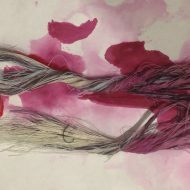 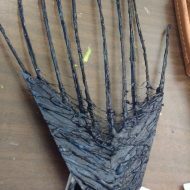 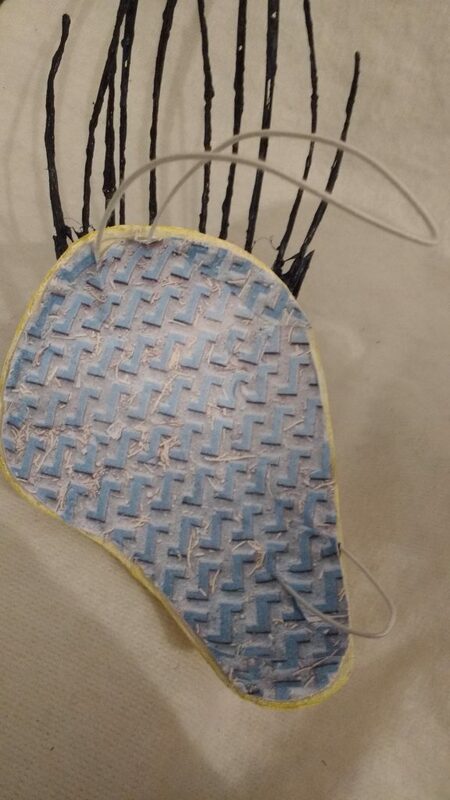 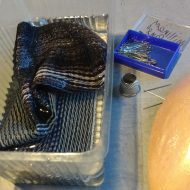 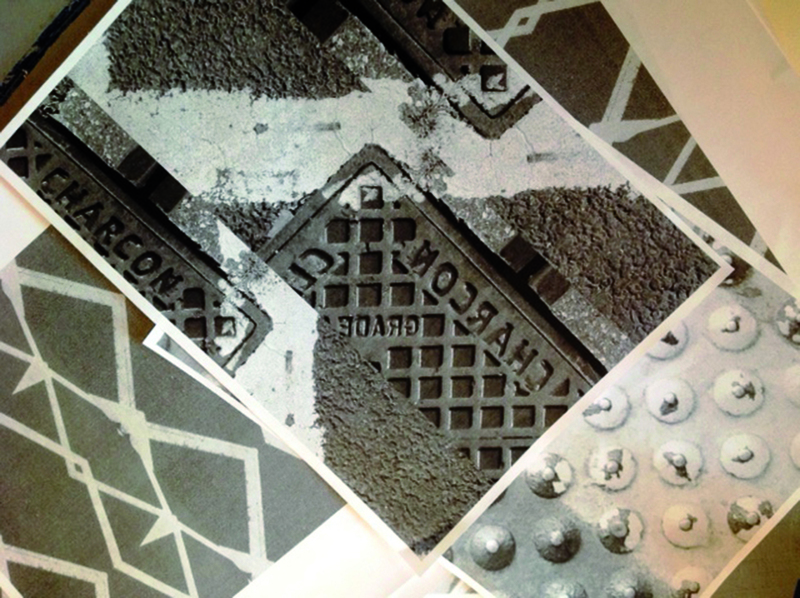 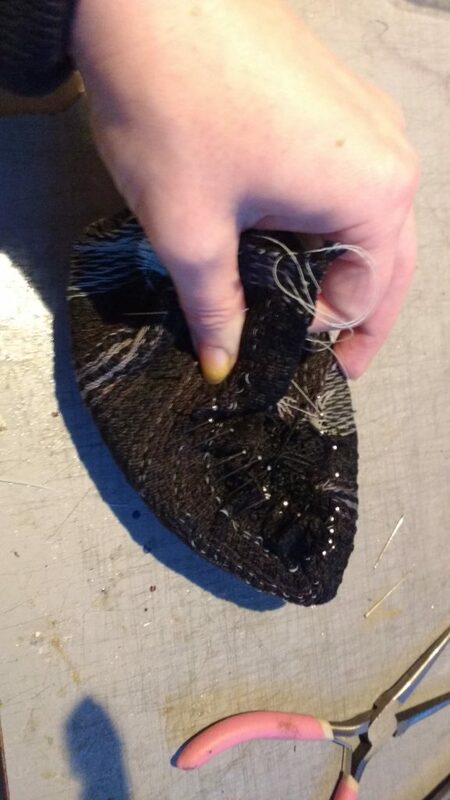 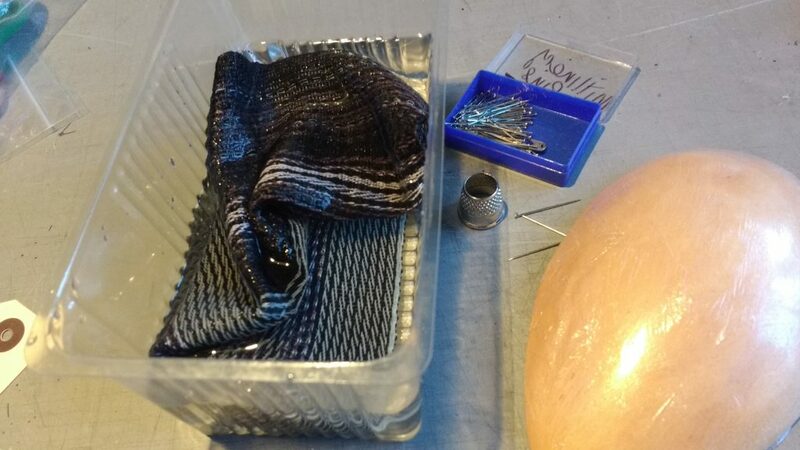 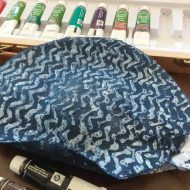 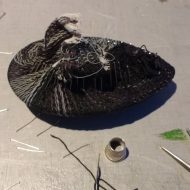 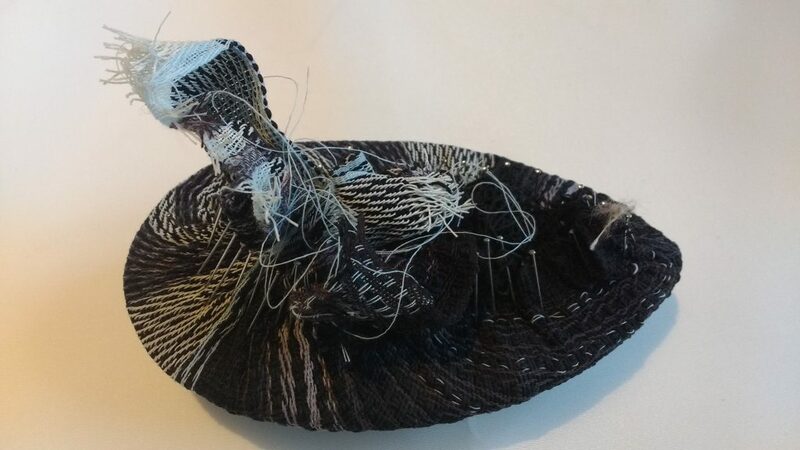 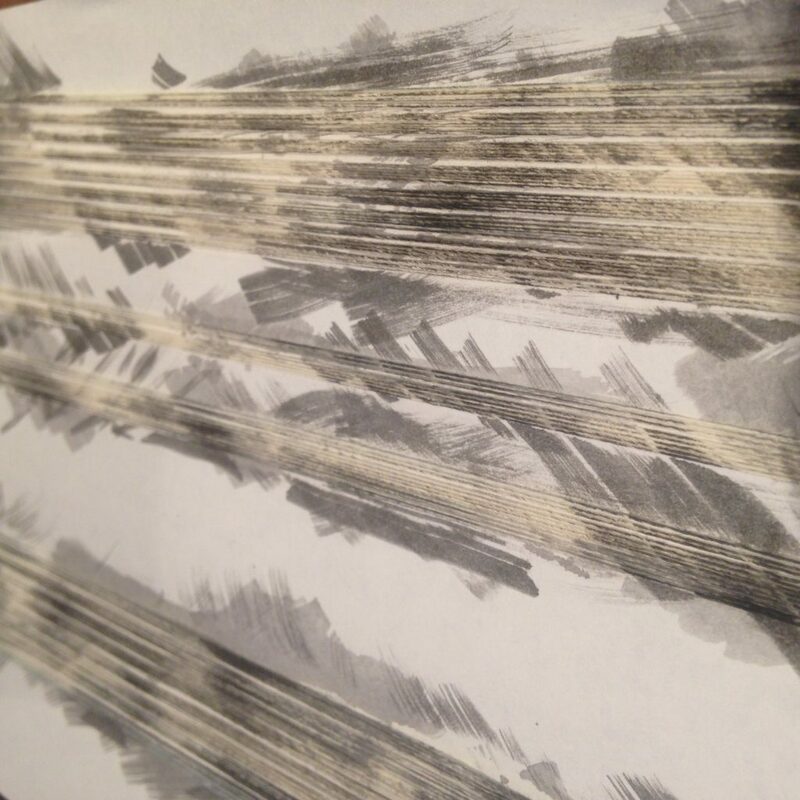 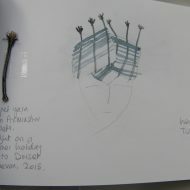 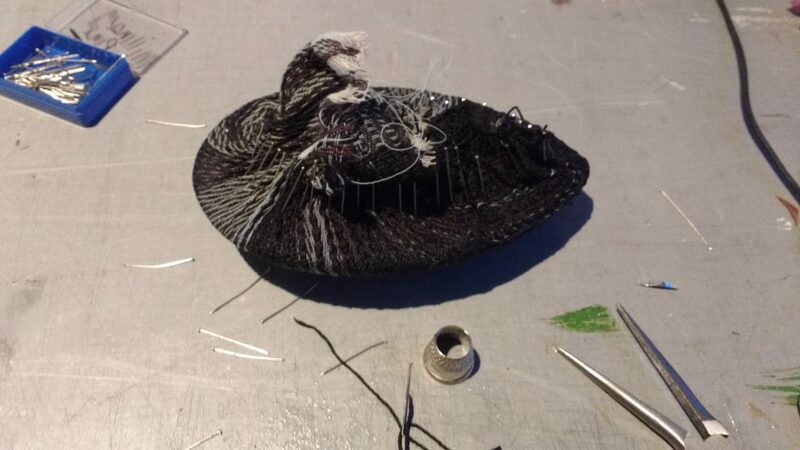 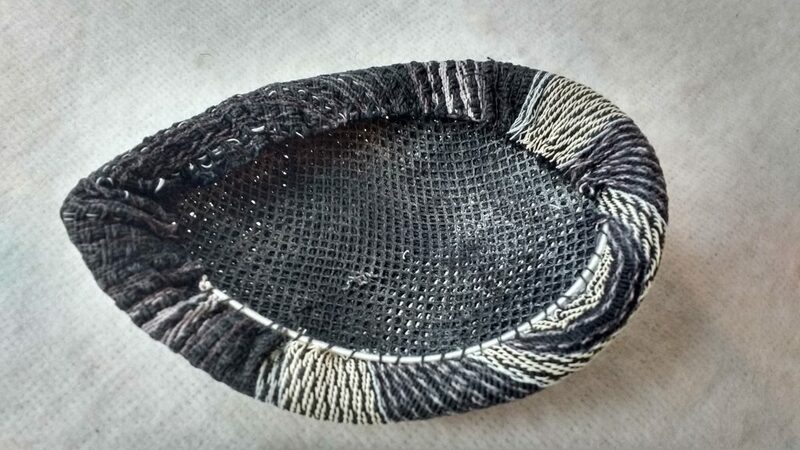 Broken threads are welcomed, getting wet making rubbings with charcoal and wax from manhole covers, using instagram to explore repeat patterns, and employing a bit of alchemy: weaving and millinery both involve the transformation of taking one thing and turning into something different.